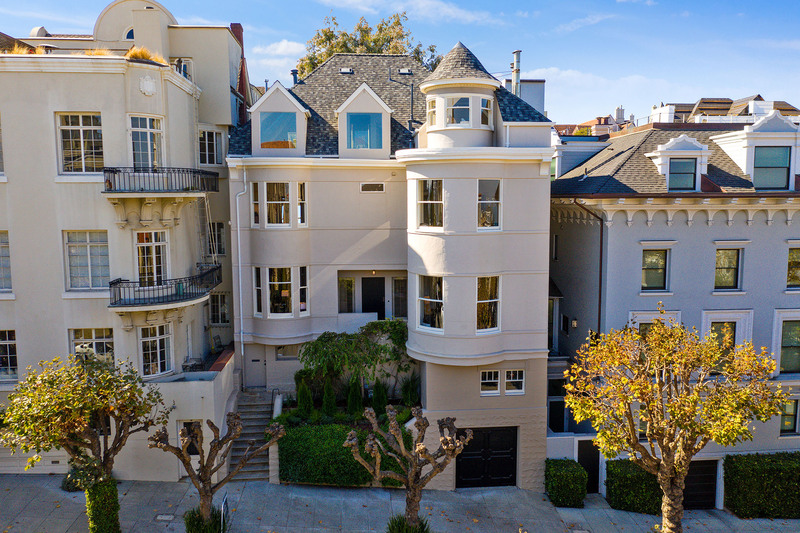 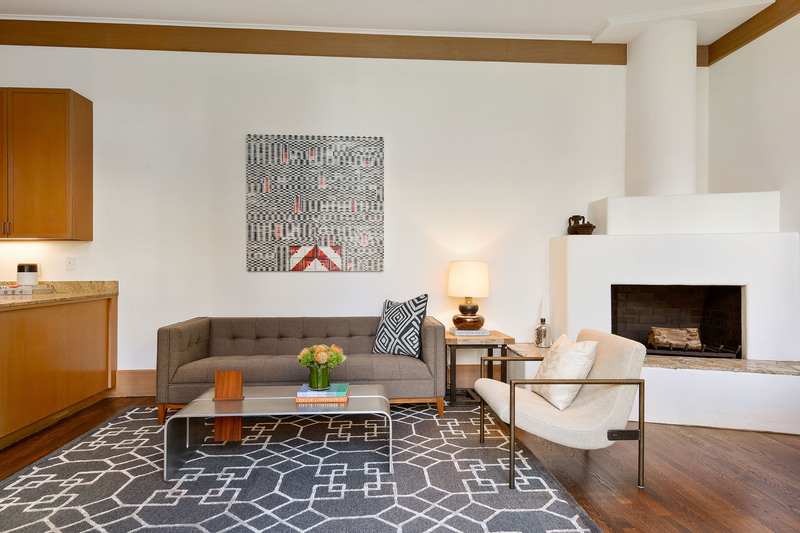 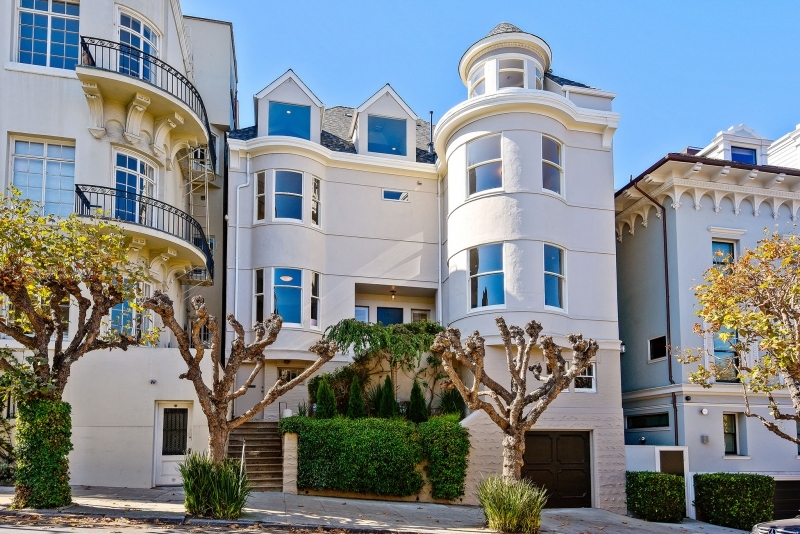 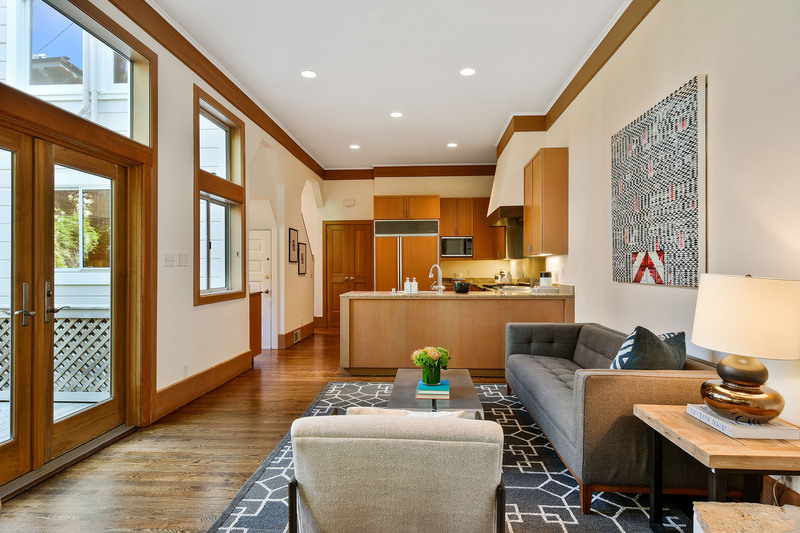 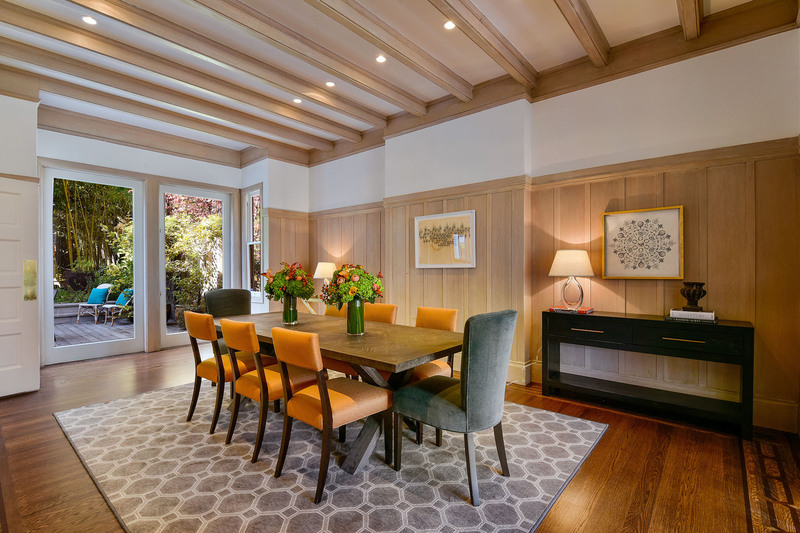 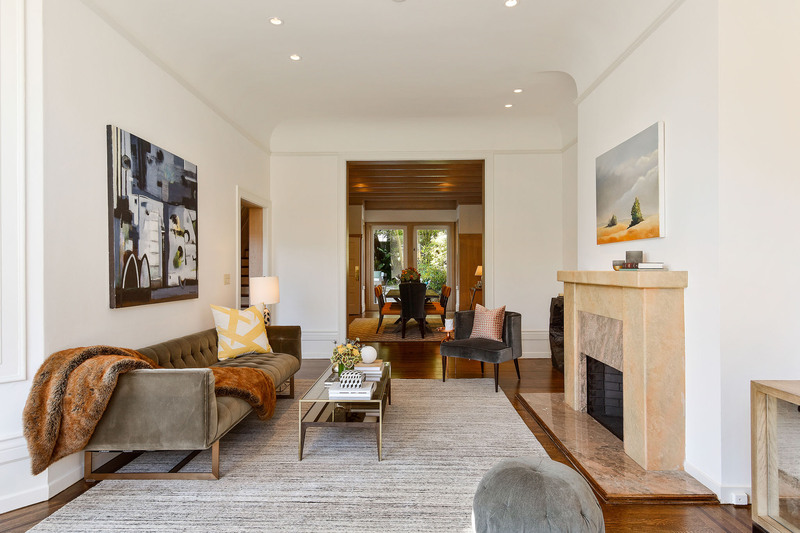 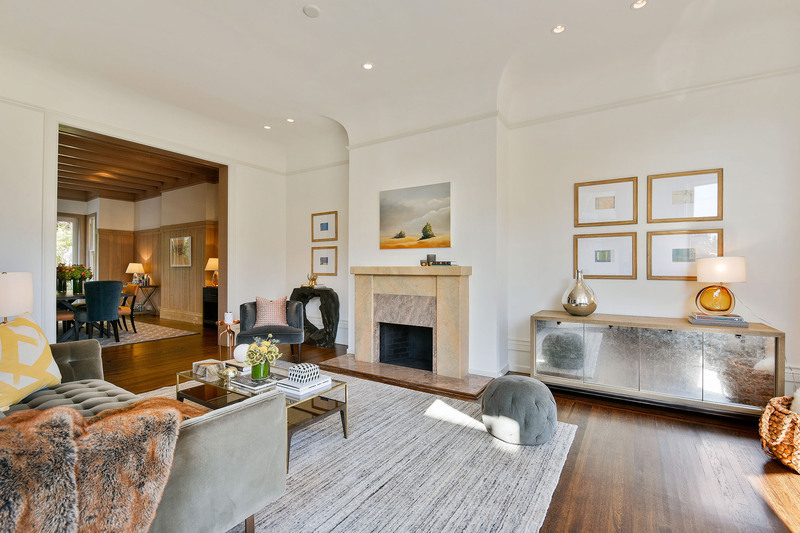 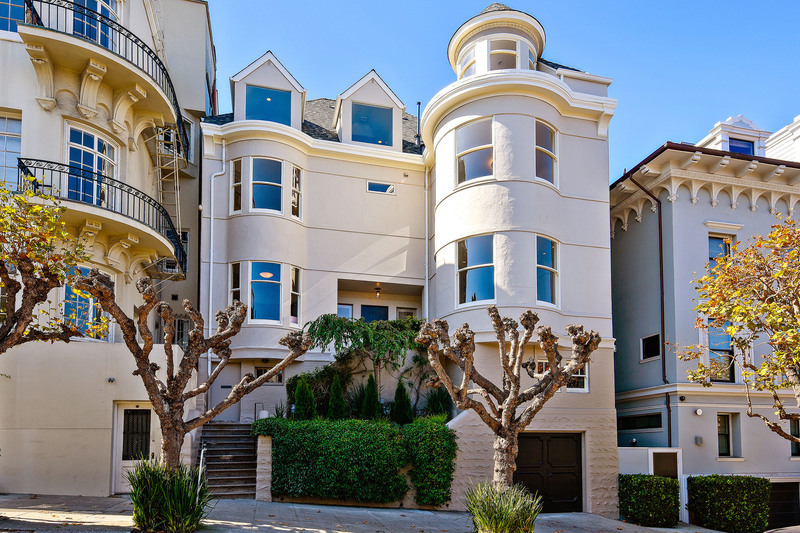 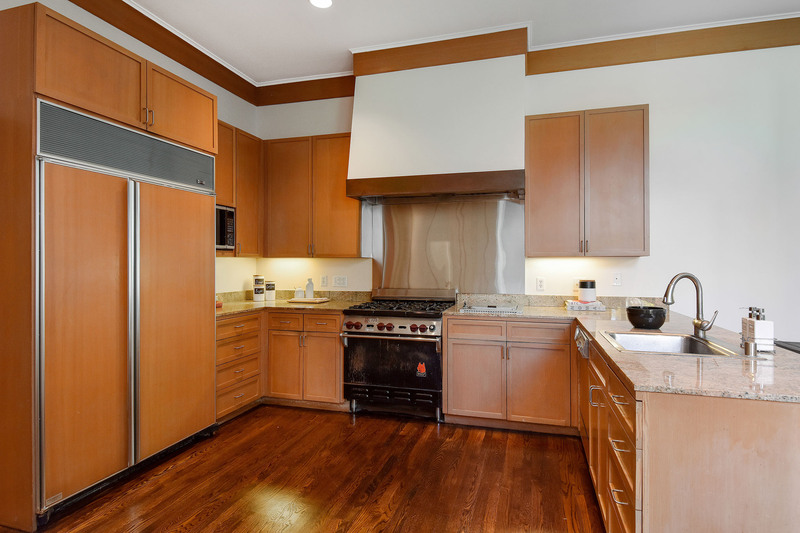 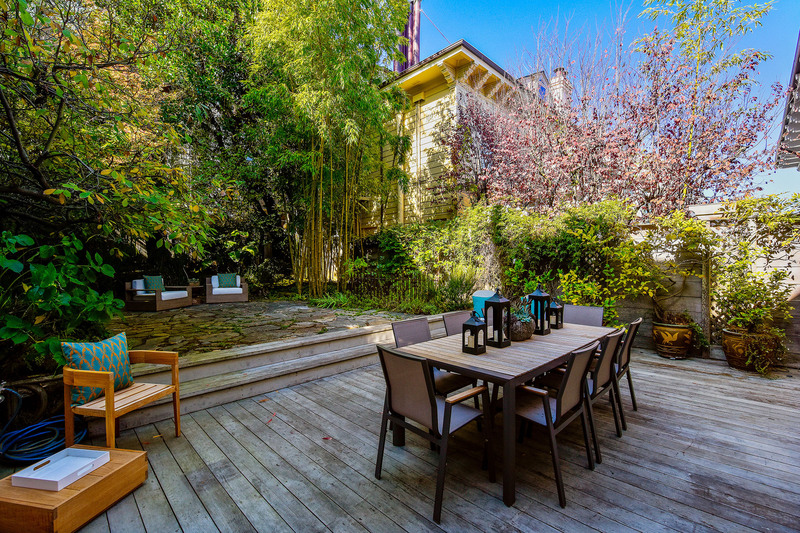 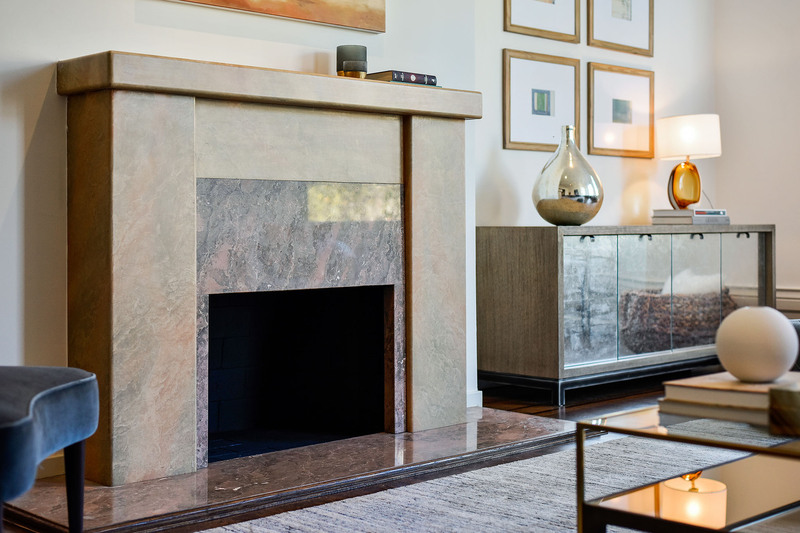 Since the turn of the century, this incredible residence has graced the heart of Pacific Heights amongst some of the finest properties in San Francisco. 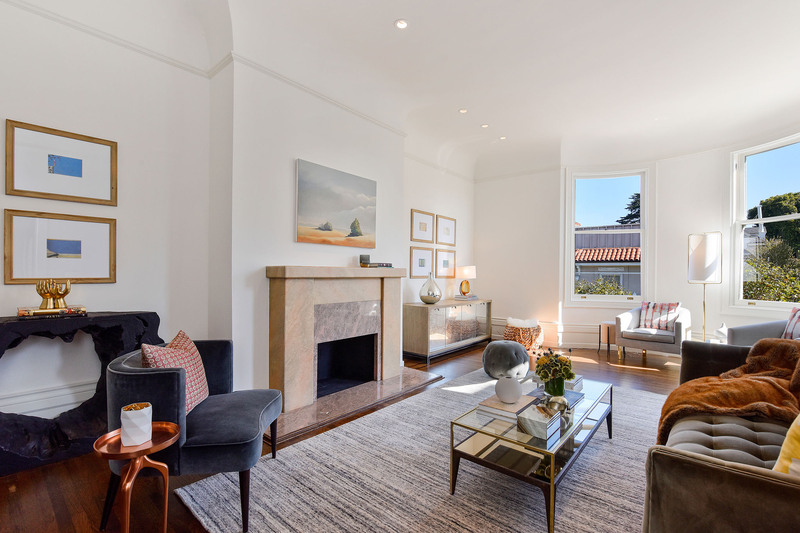 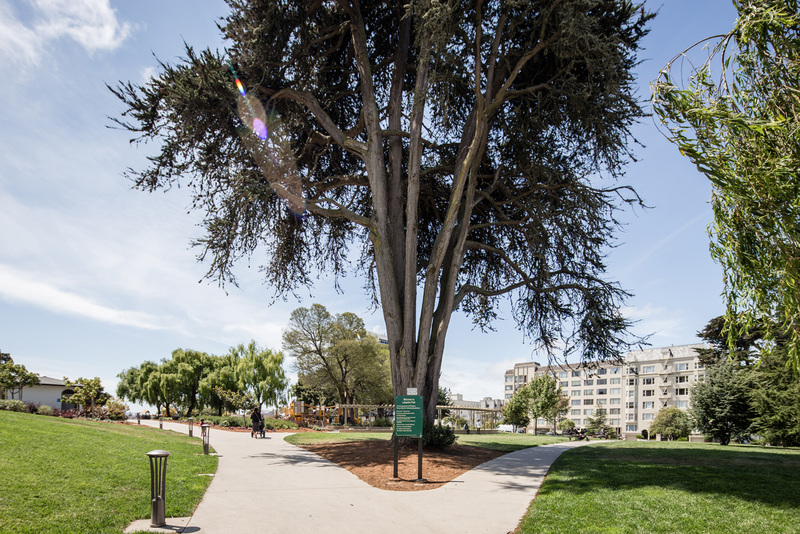 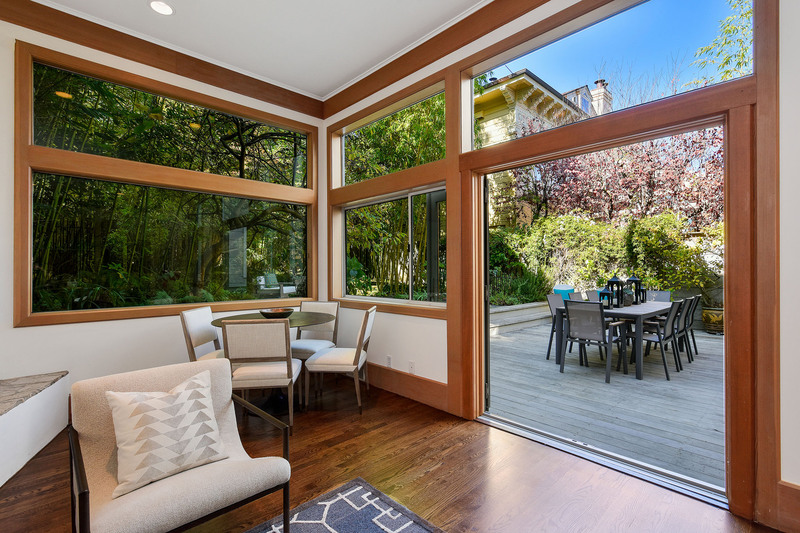 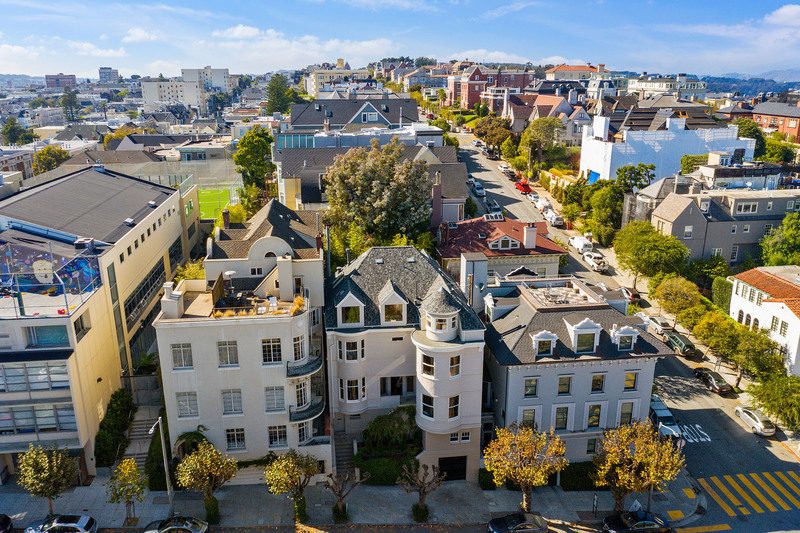 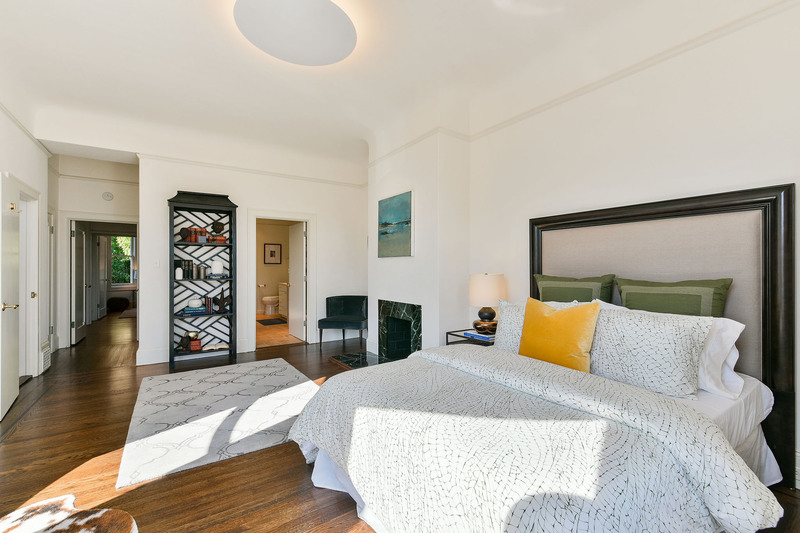 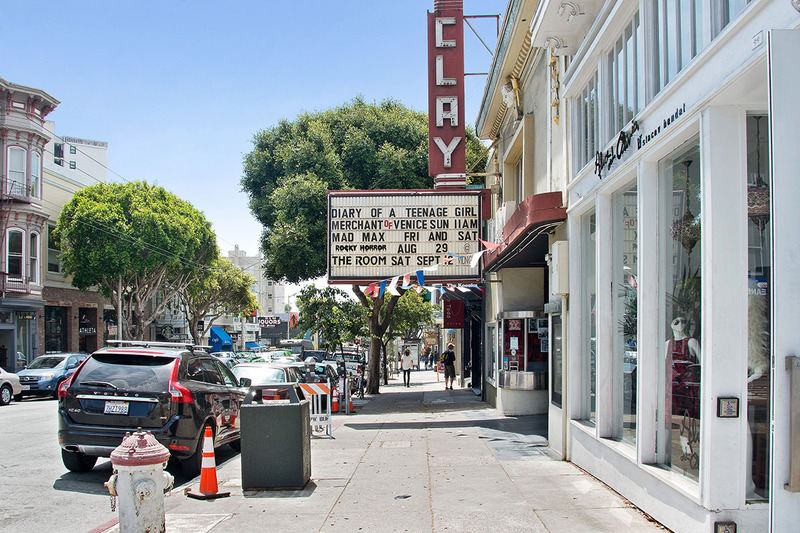 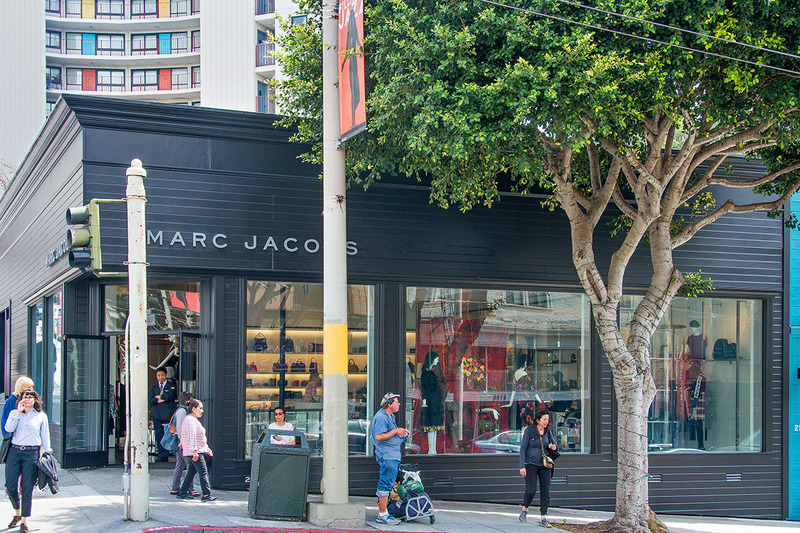 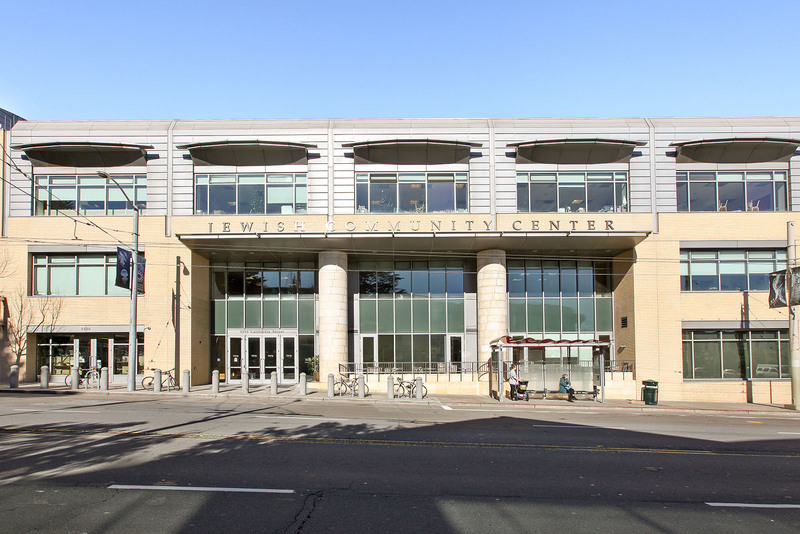 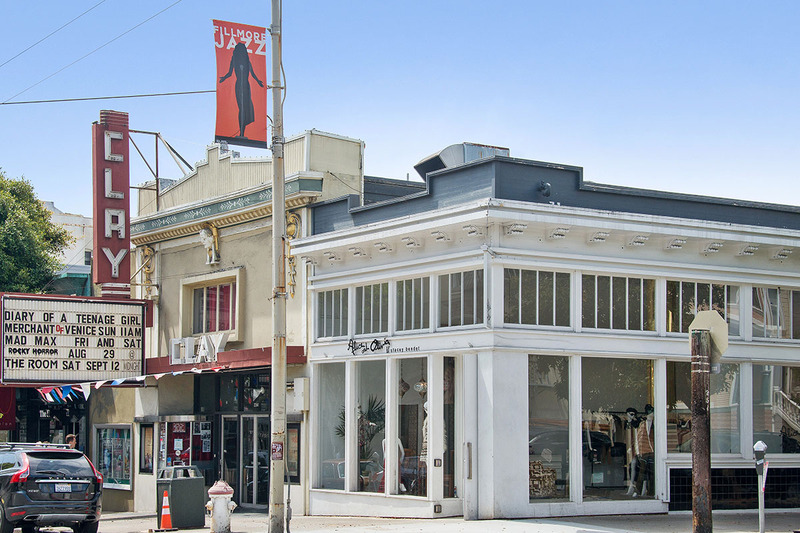 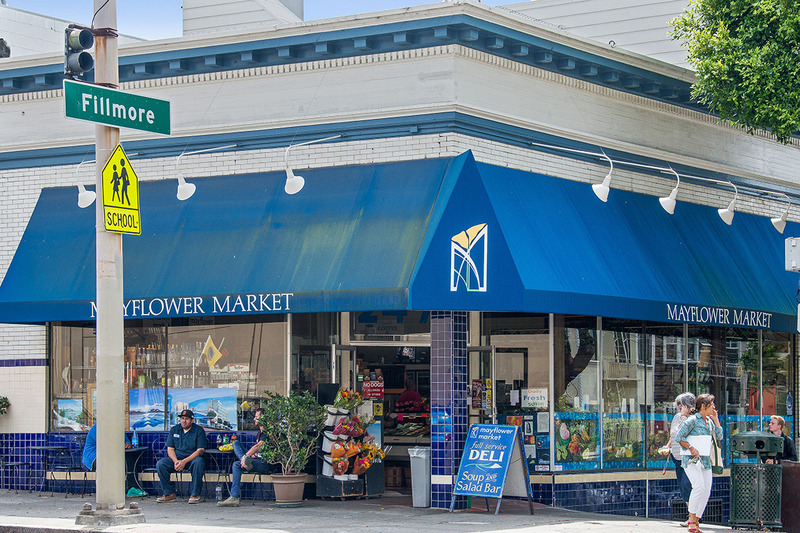 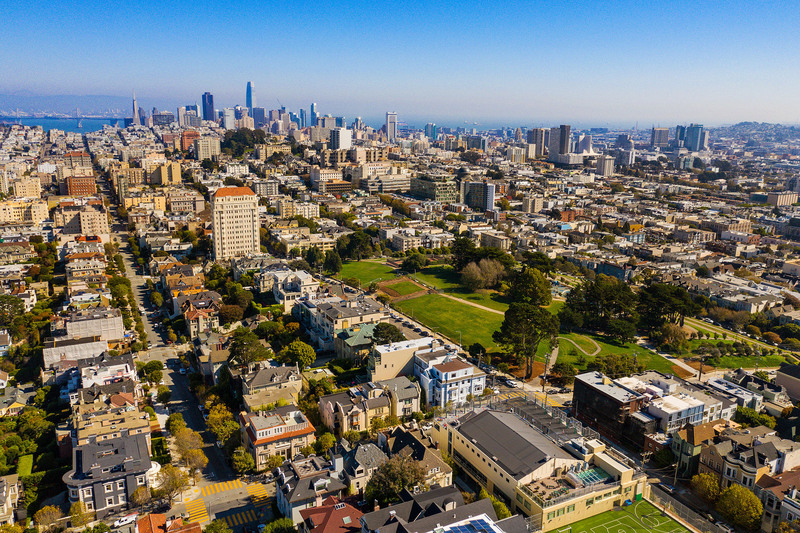 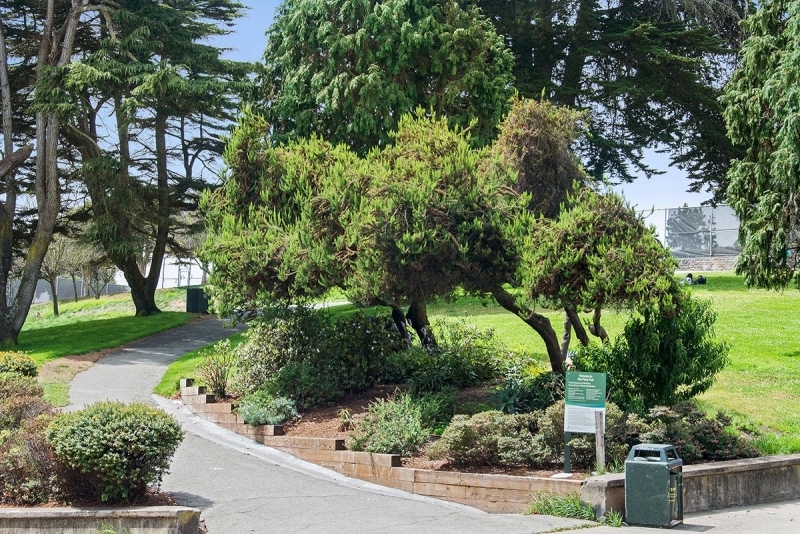 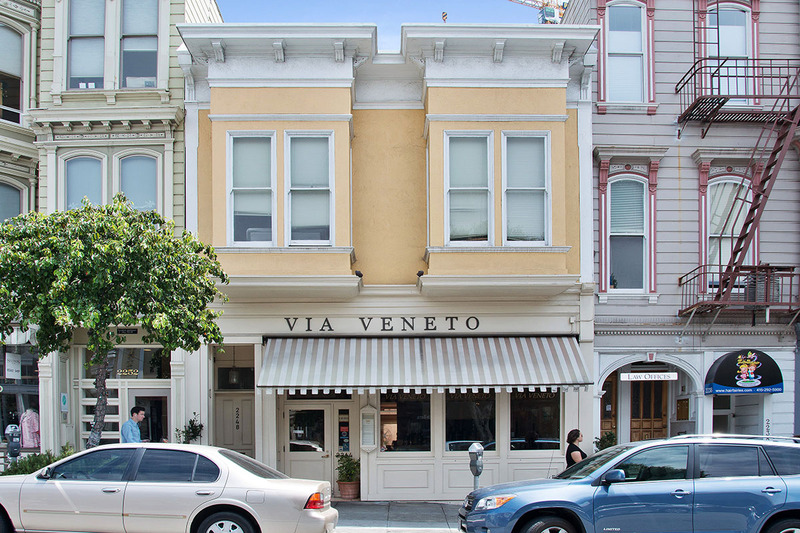 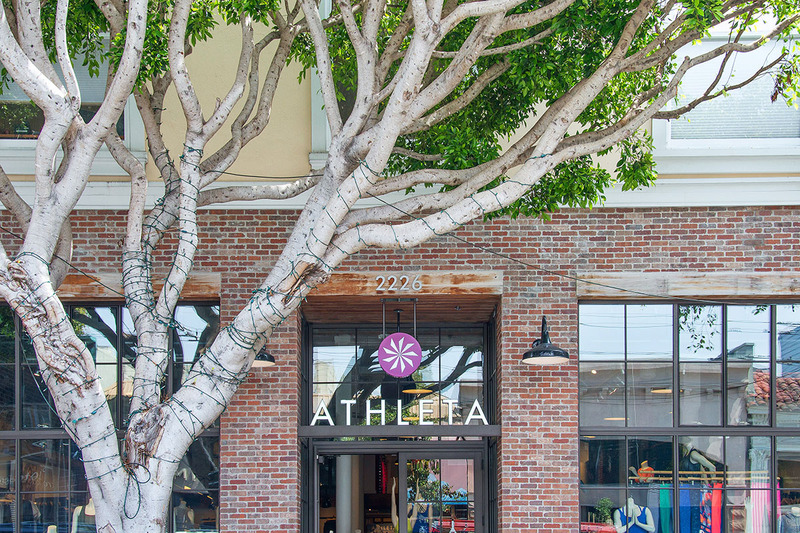 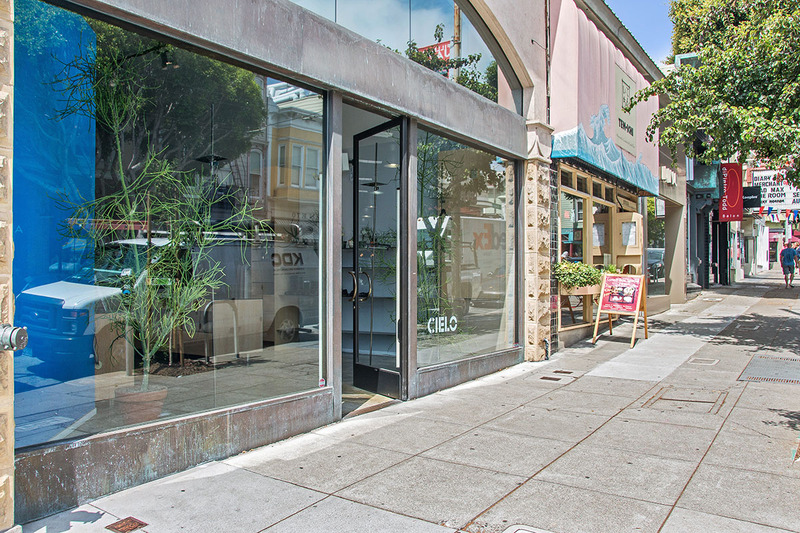 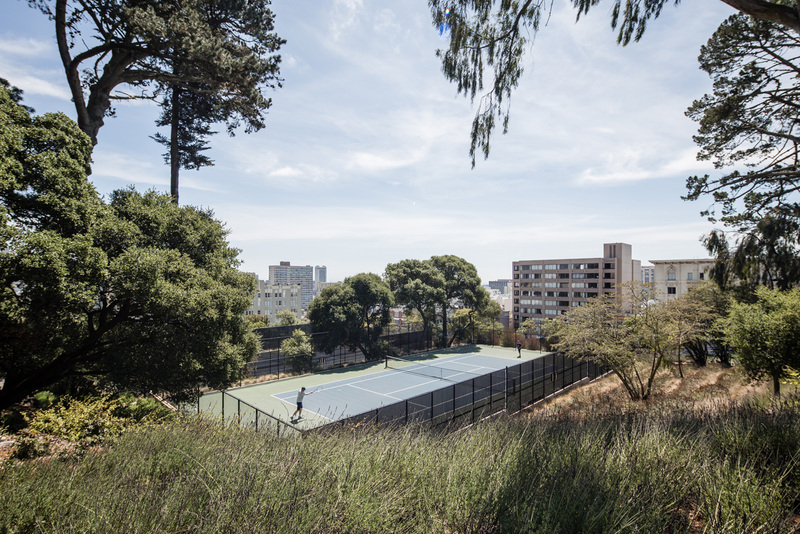 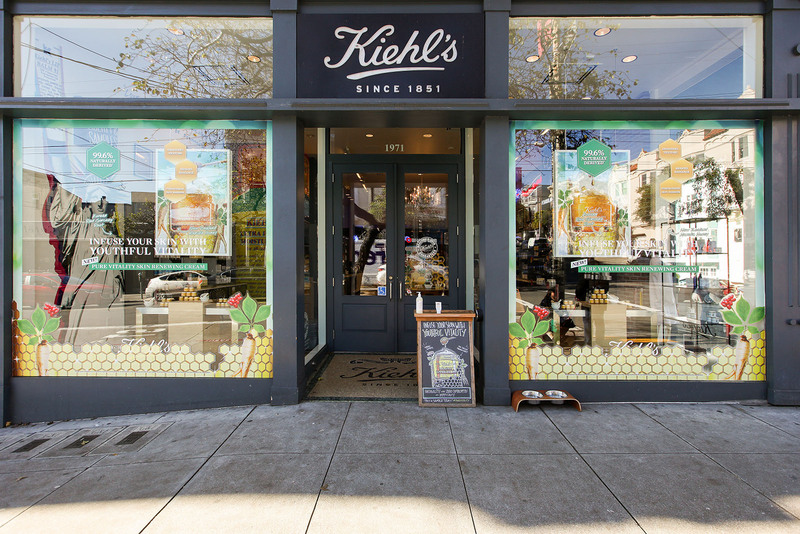 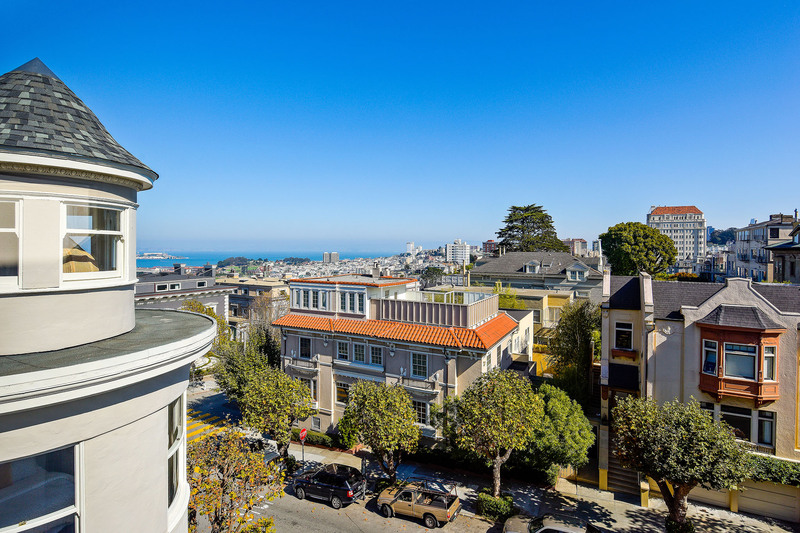 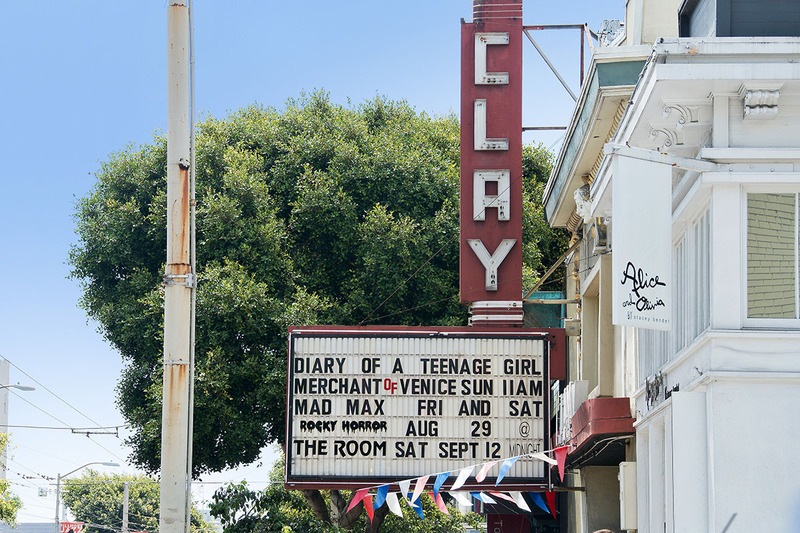 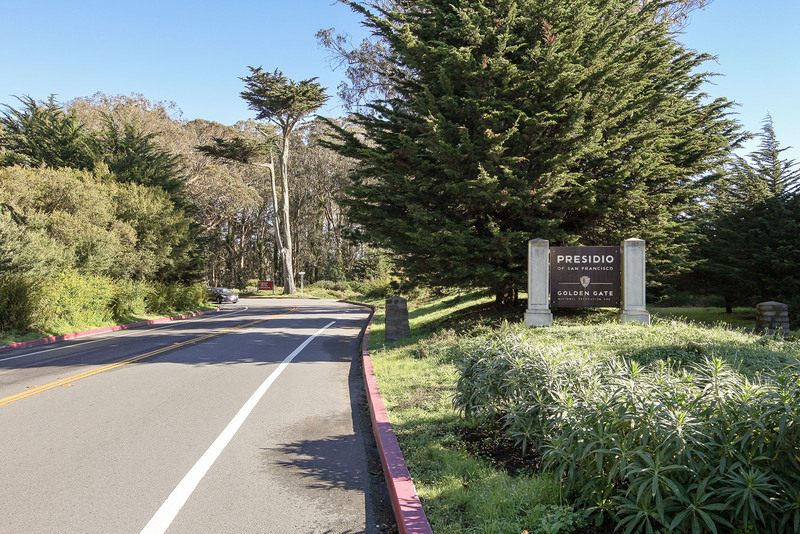 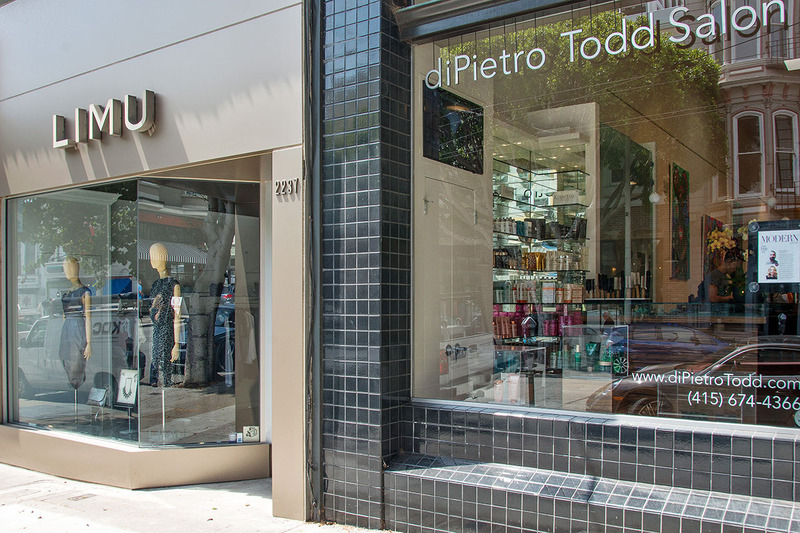 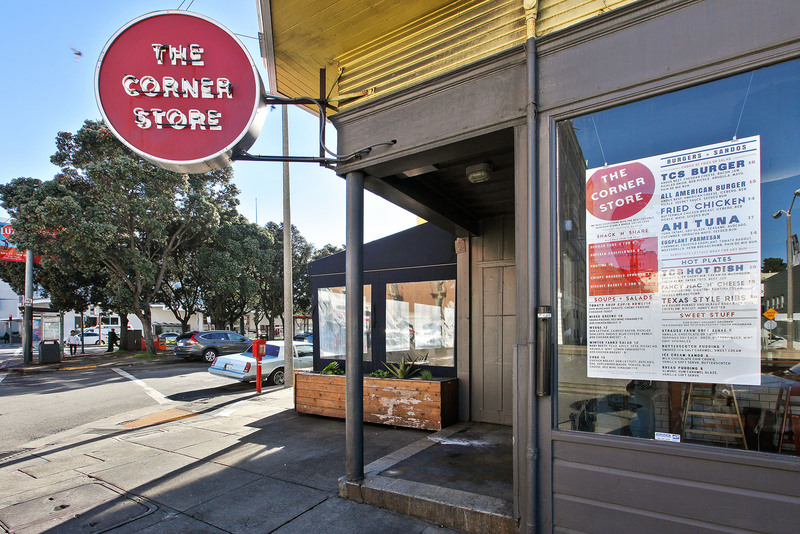 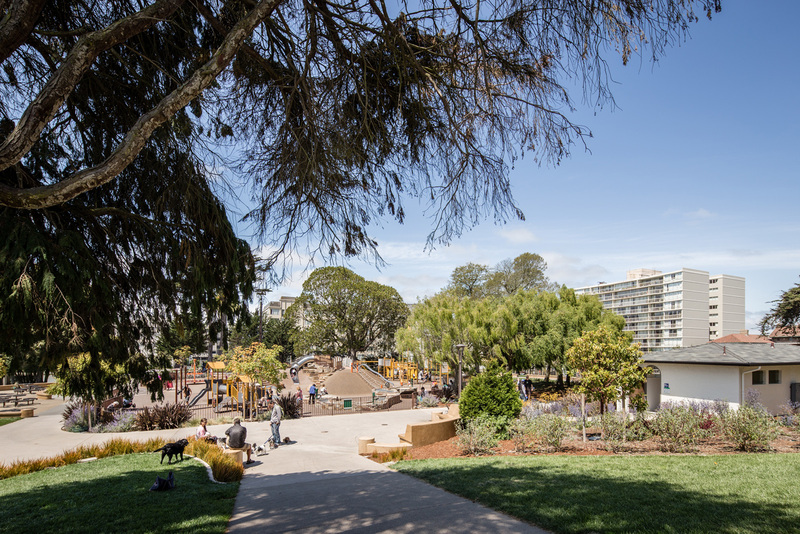 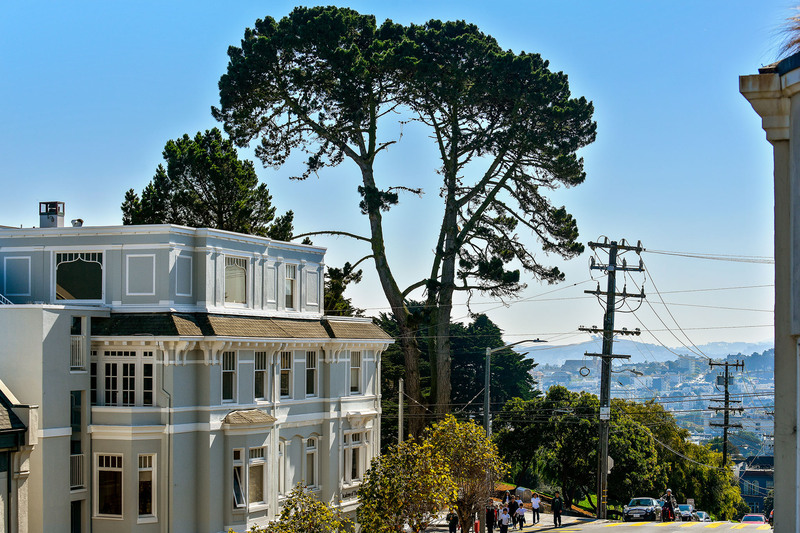 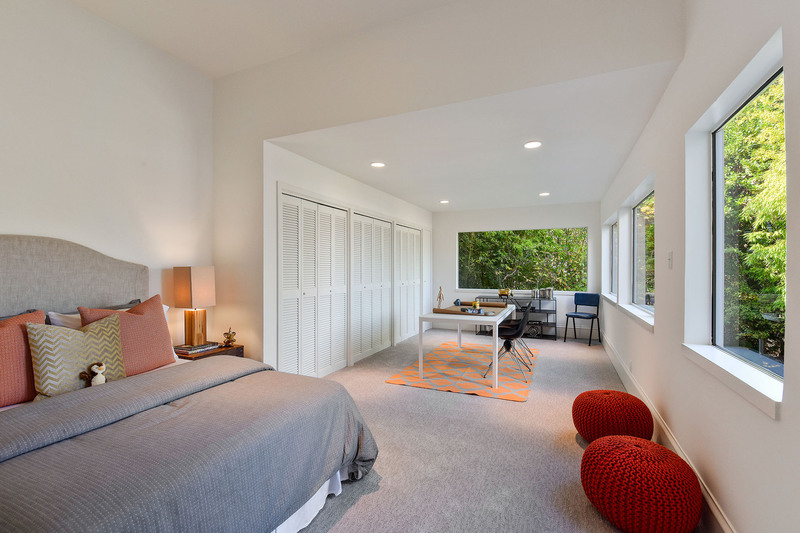 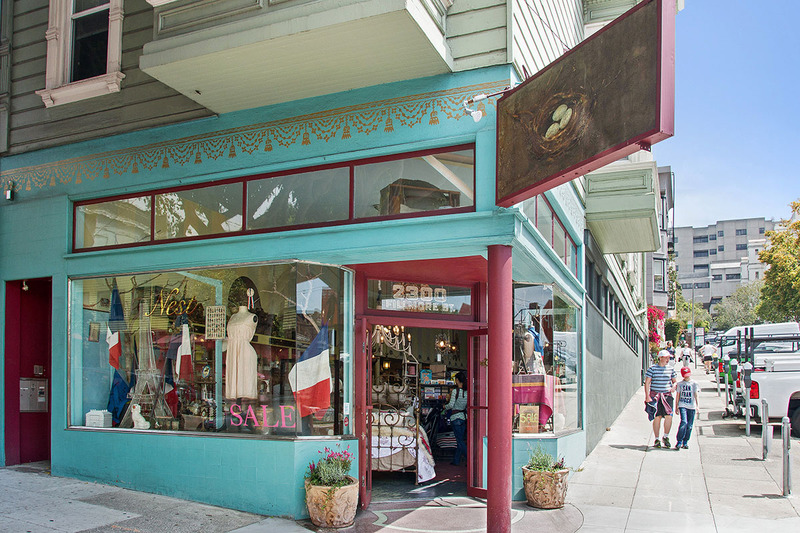 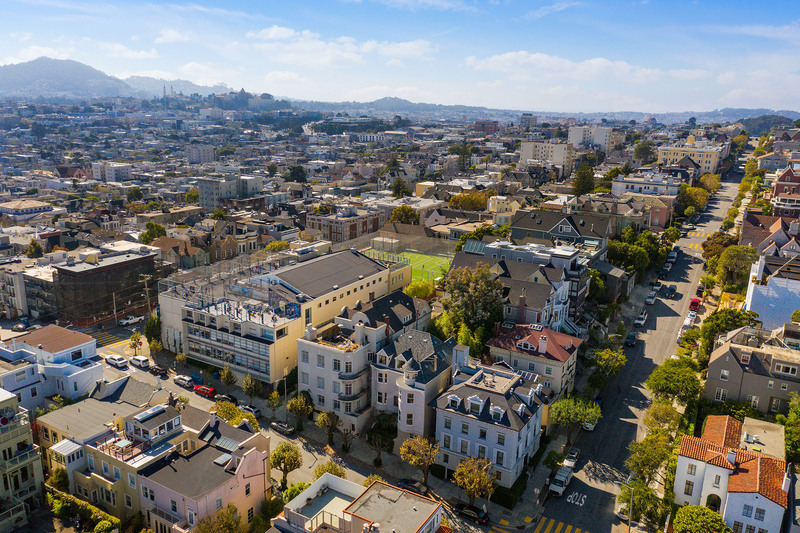 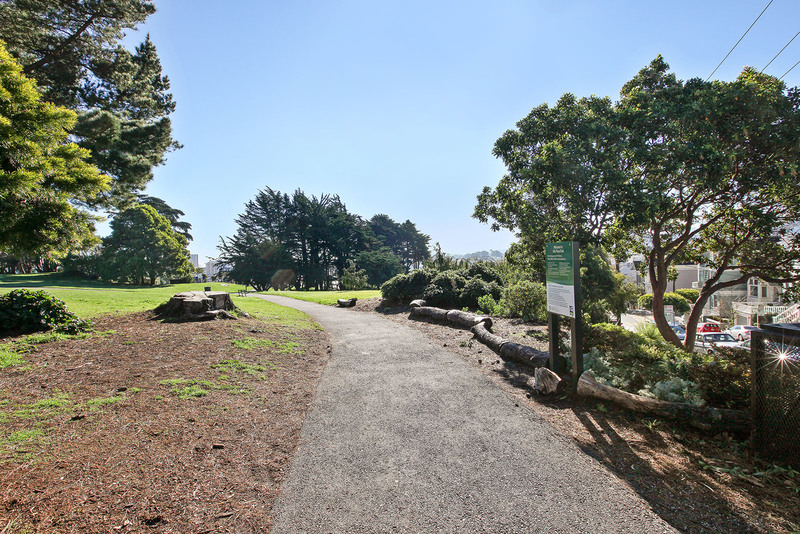 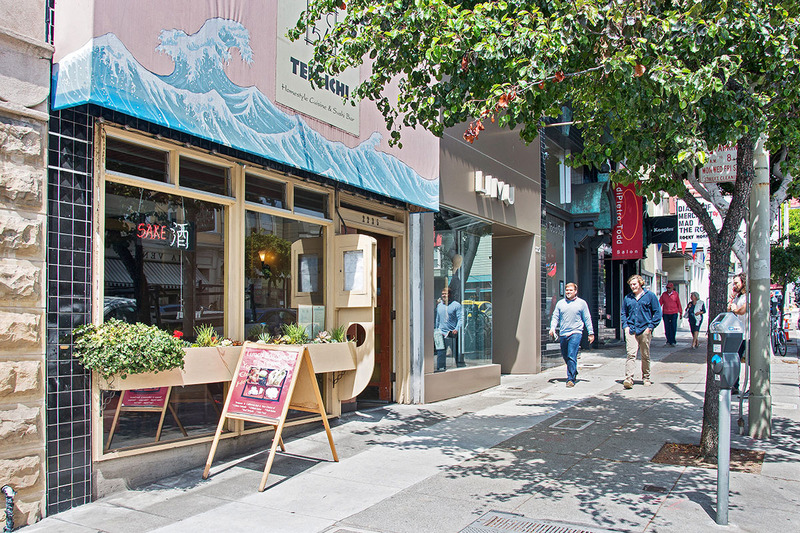 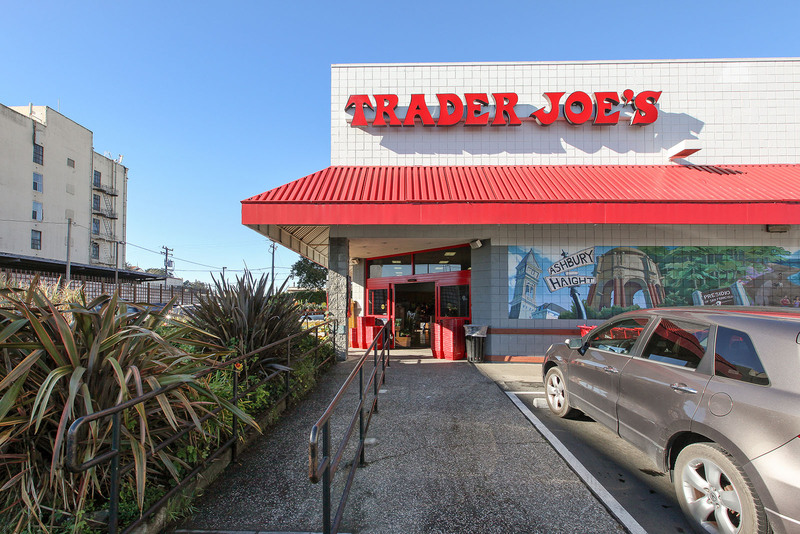 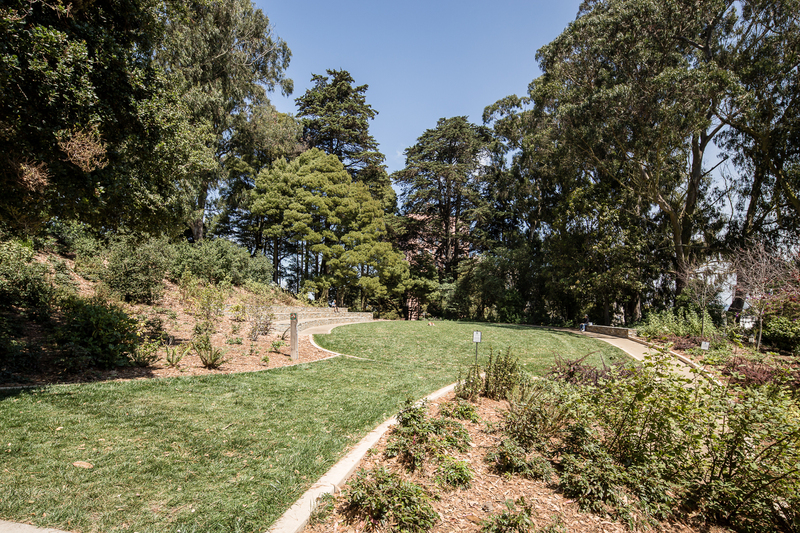 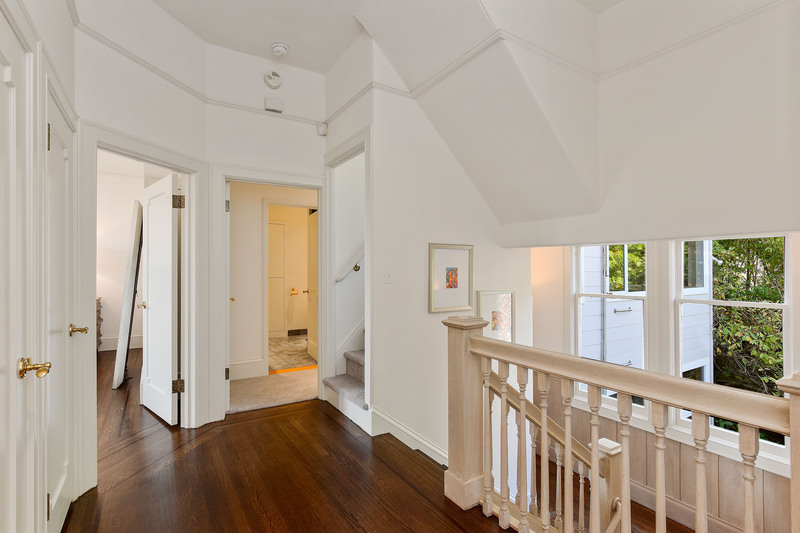 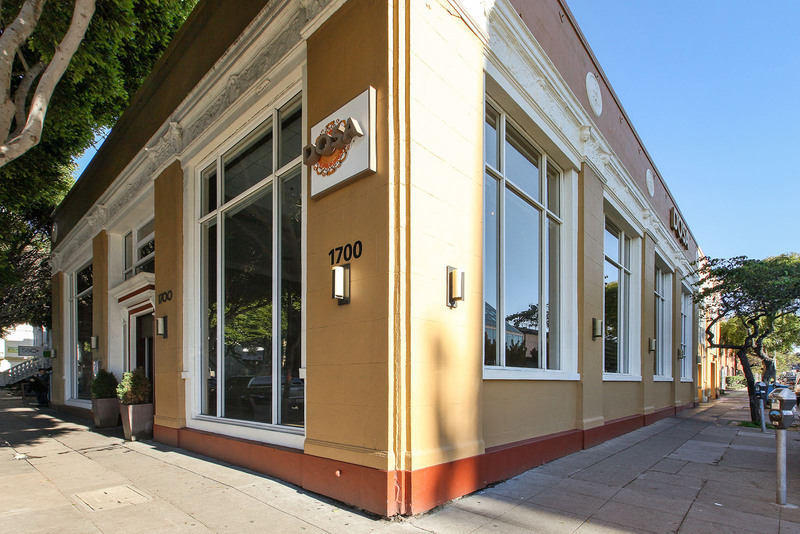 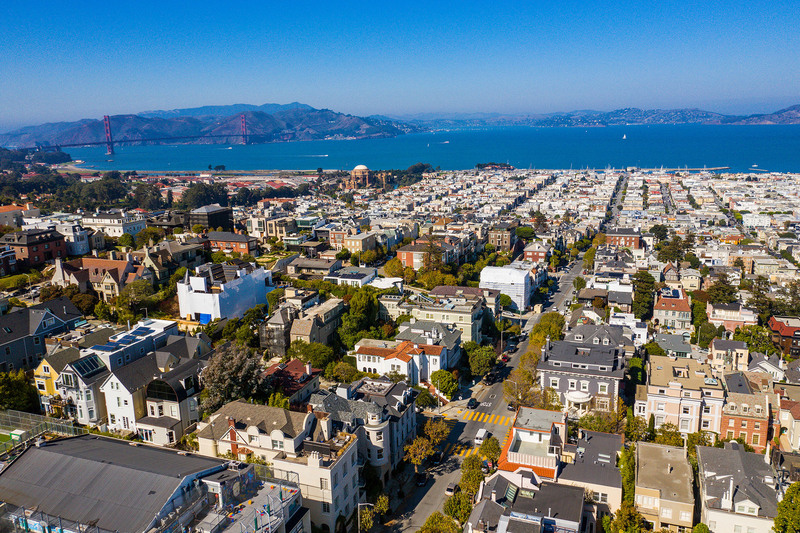 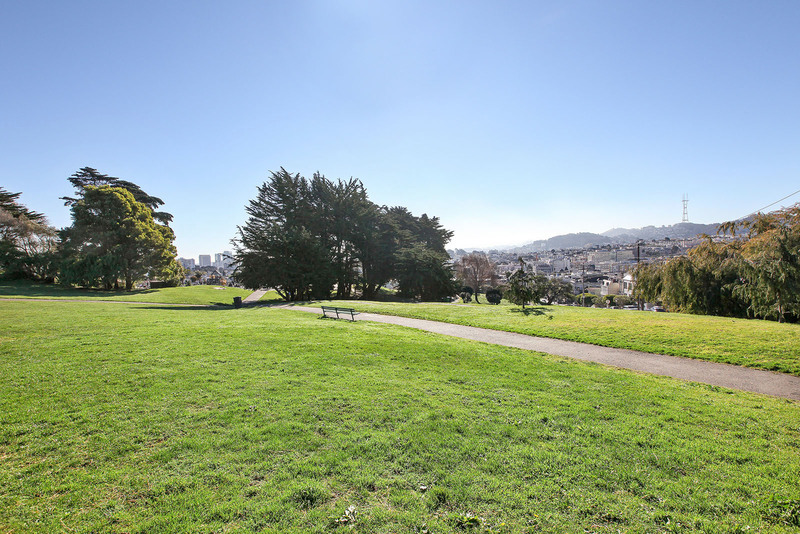 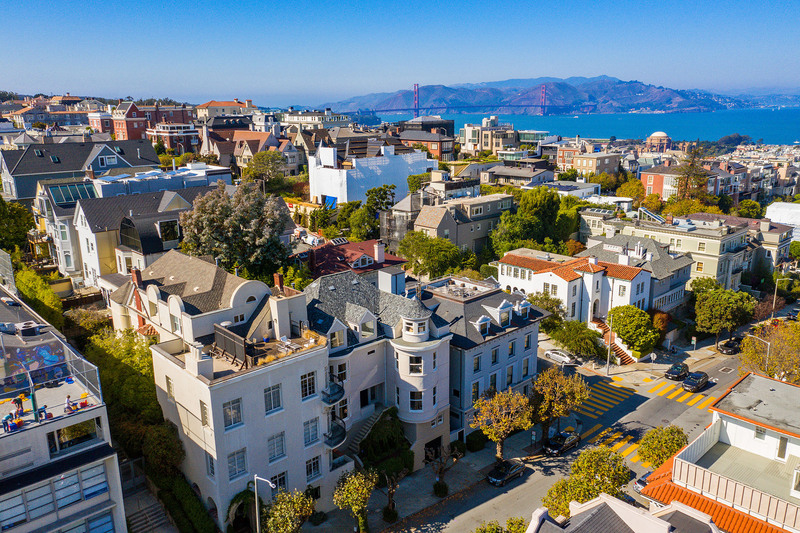 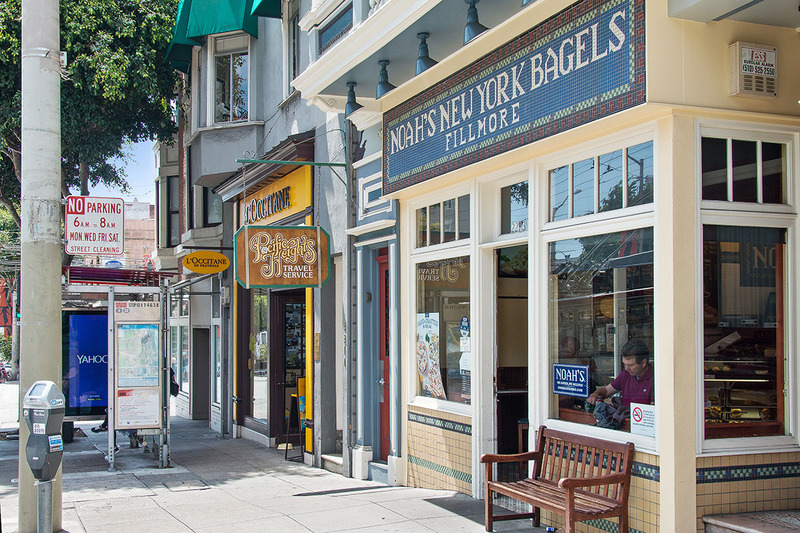 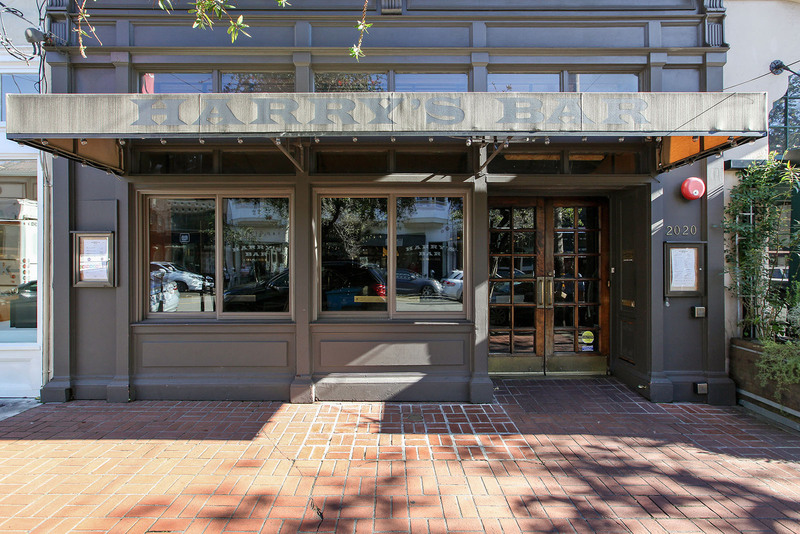 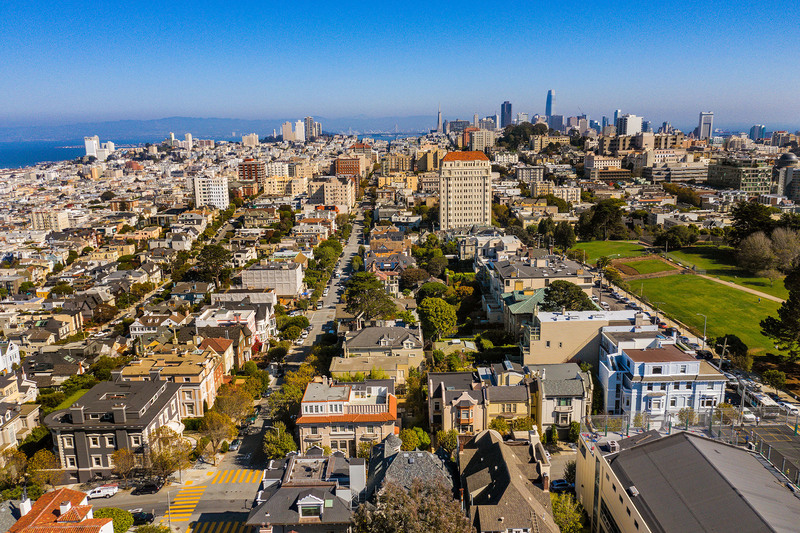 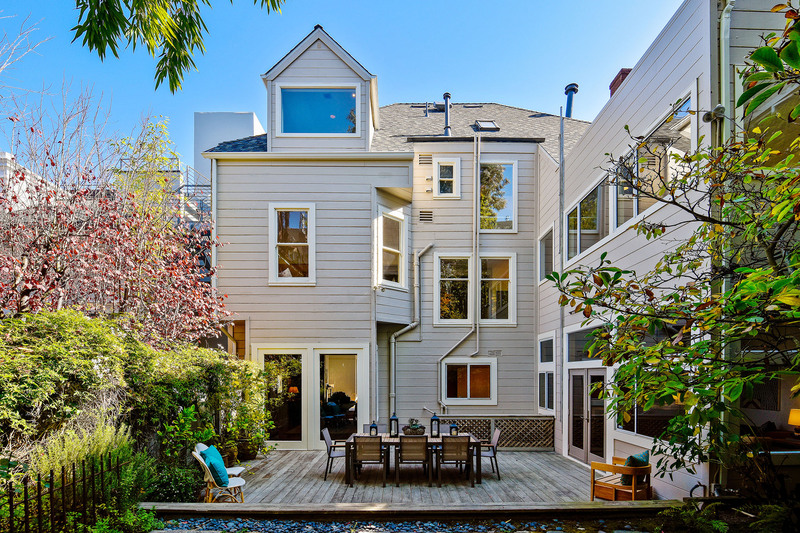 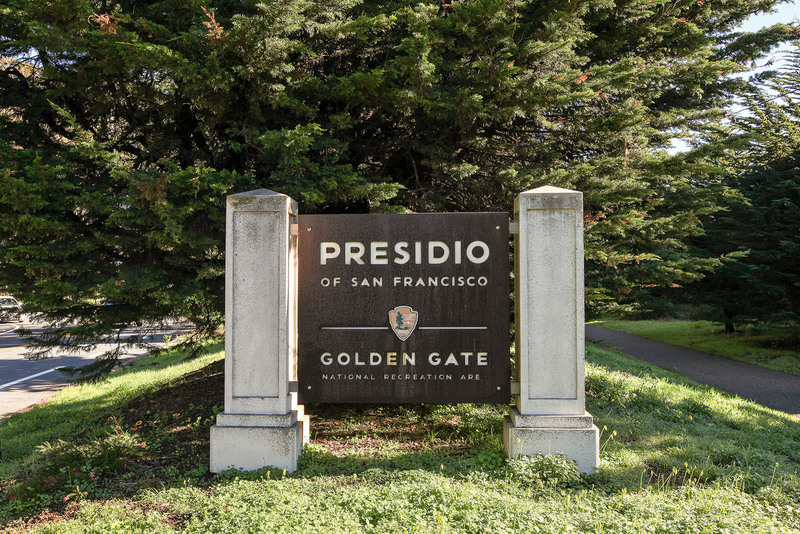 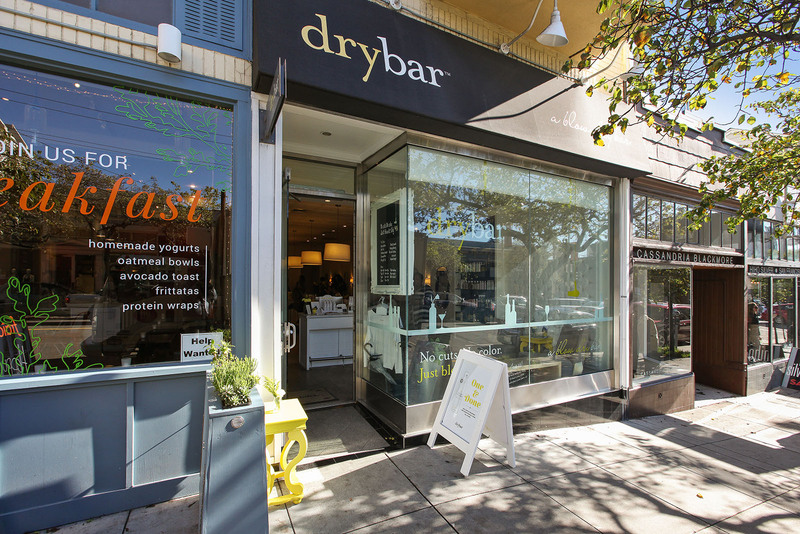 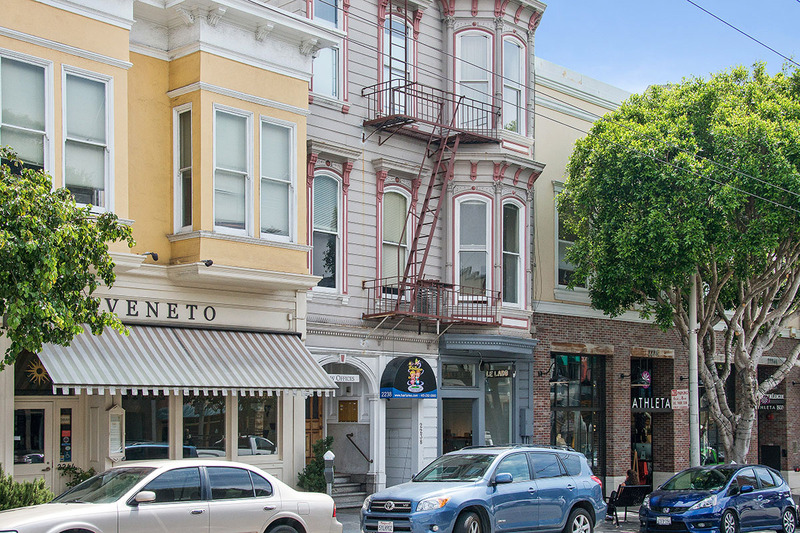 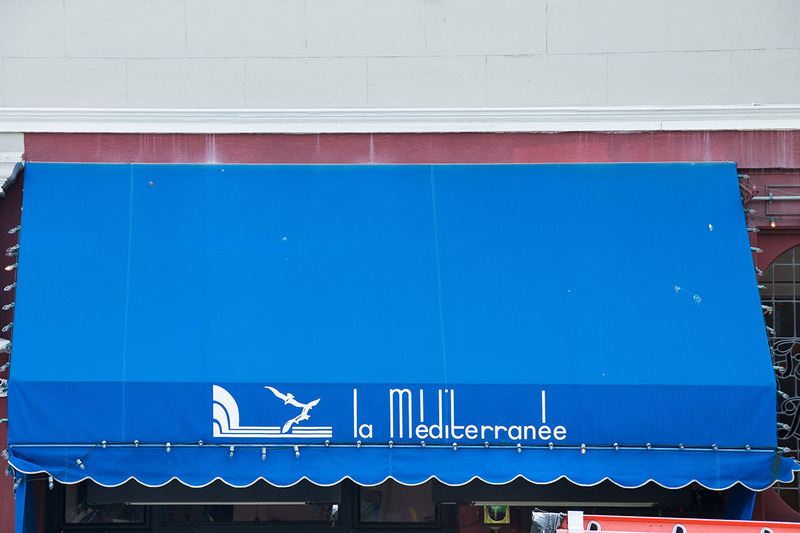 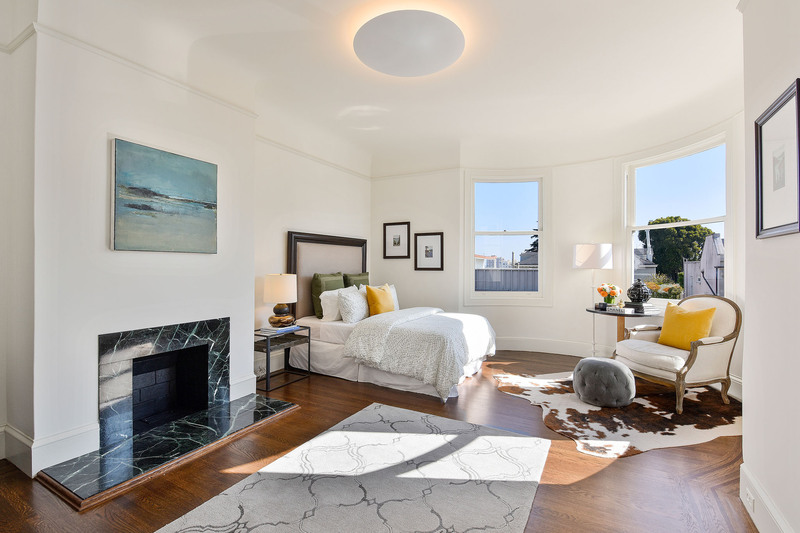 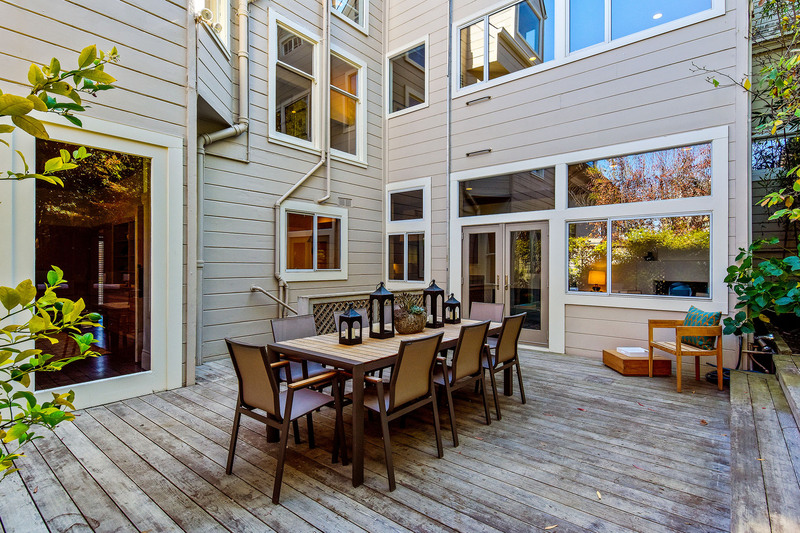 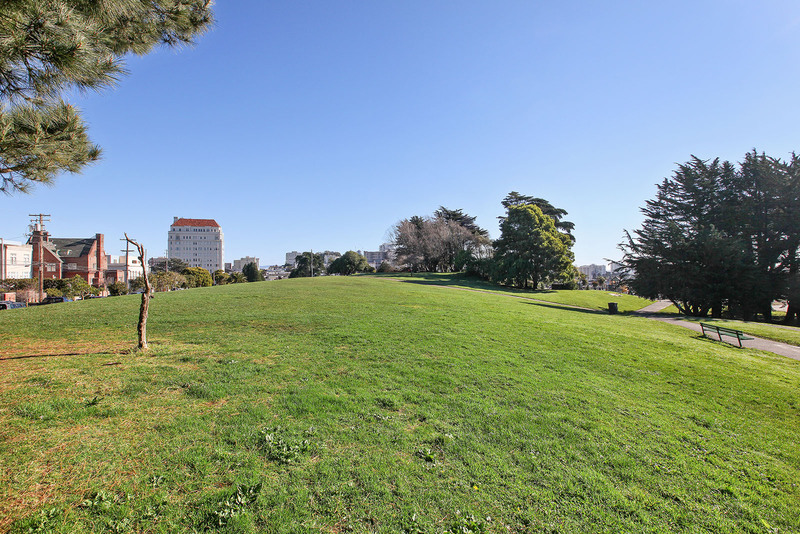 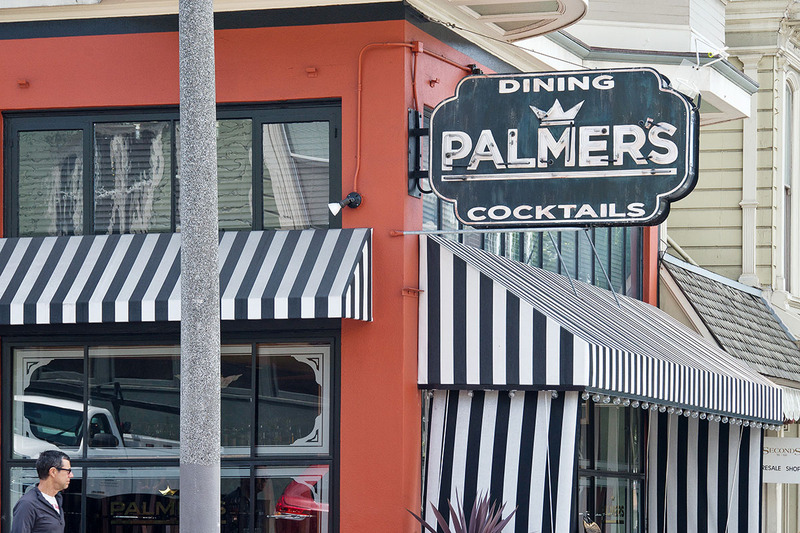 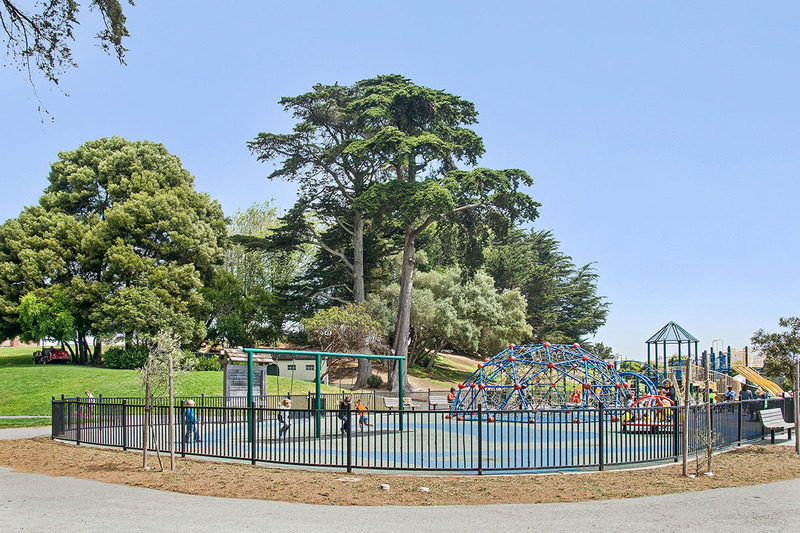 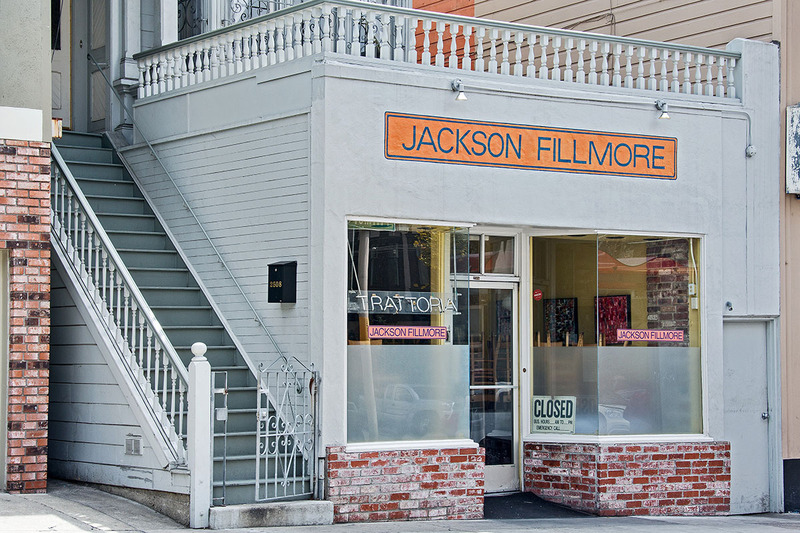 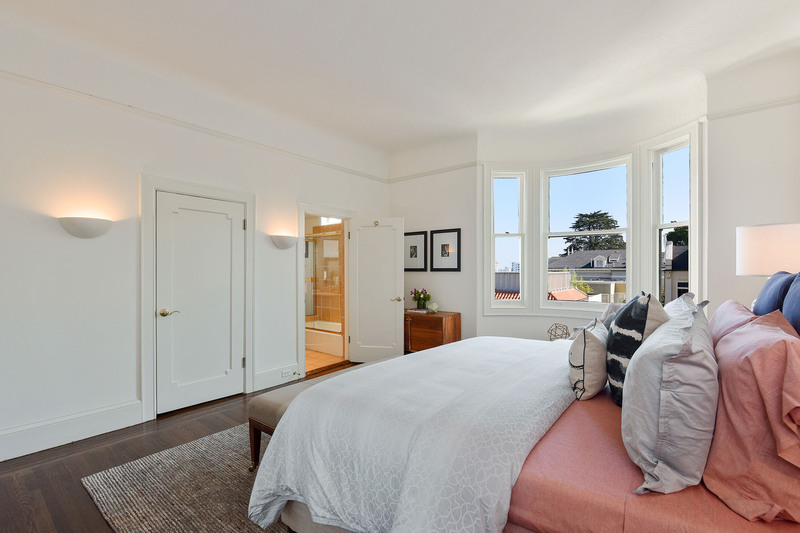 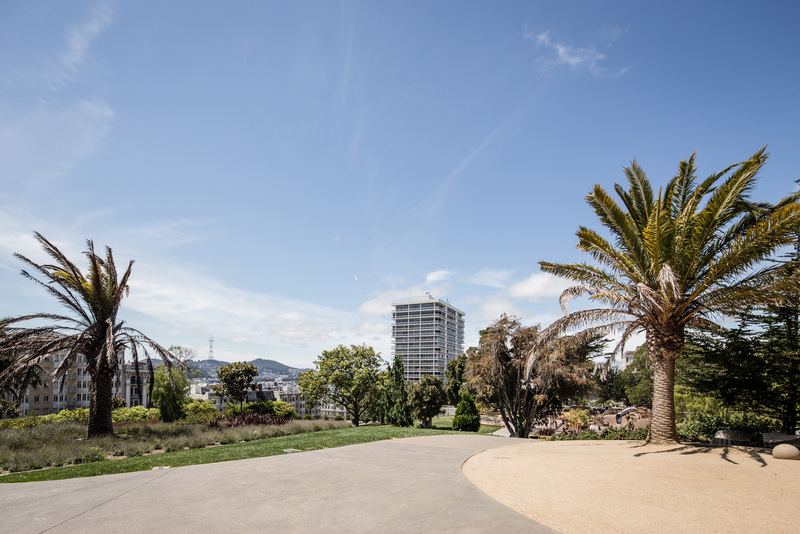 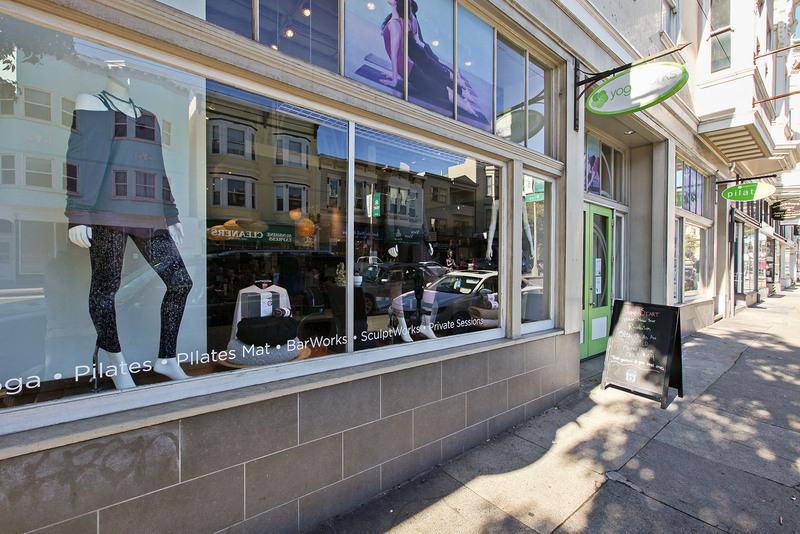 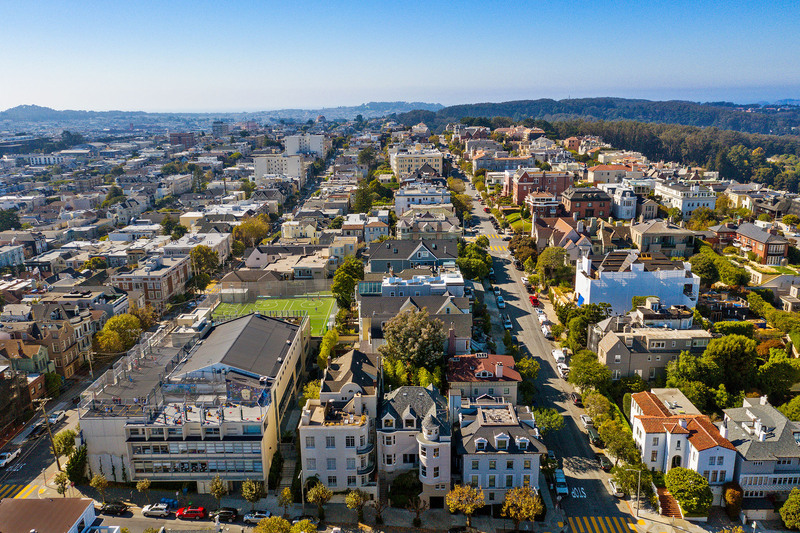 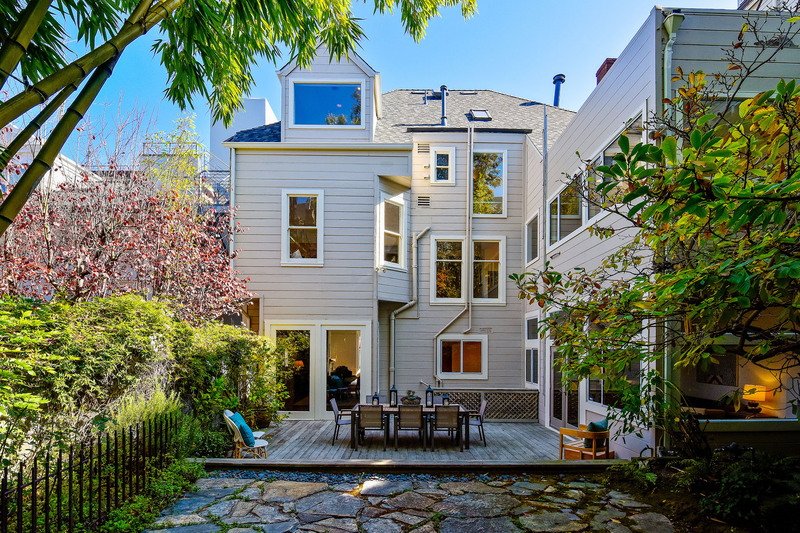 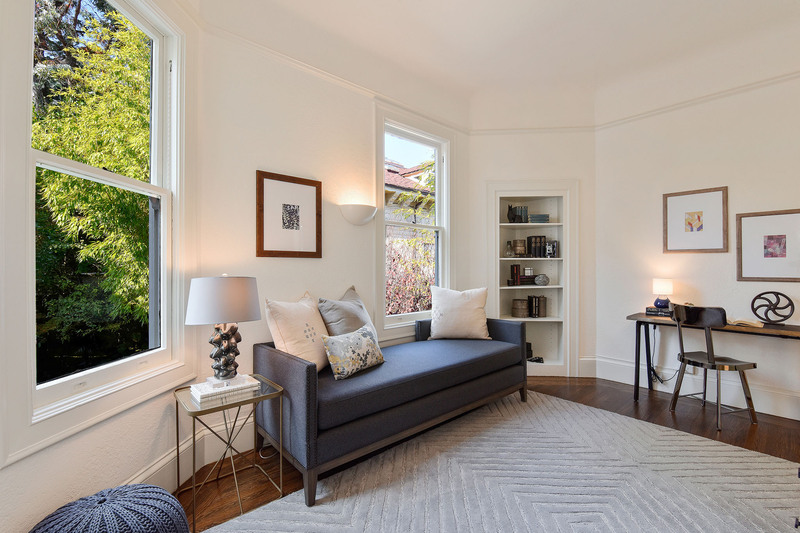 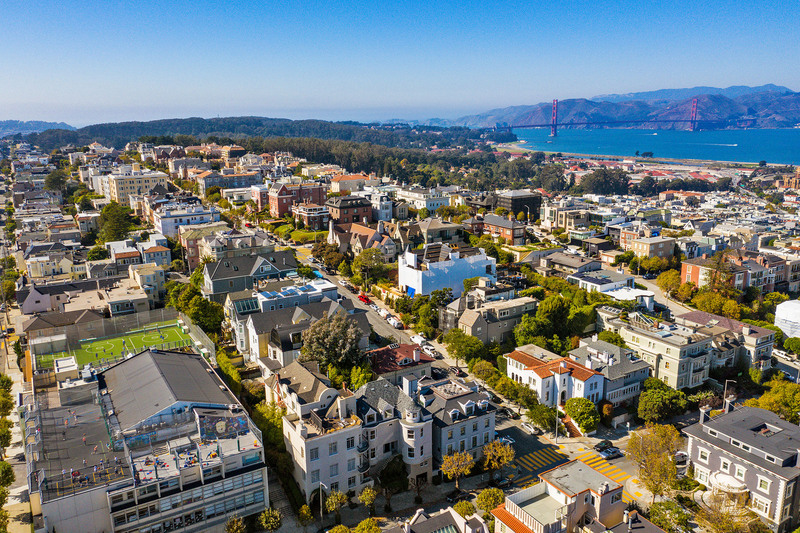 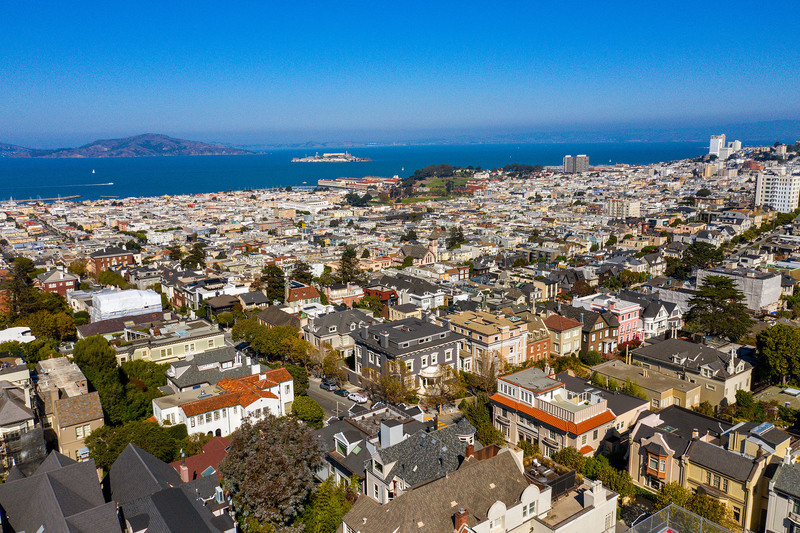 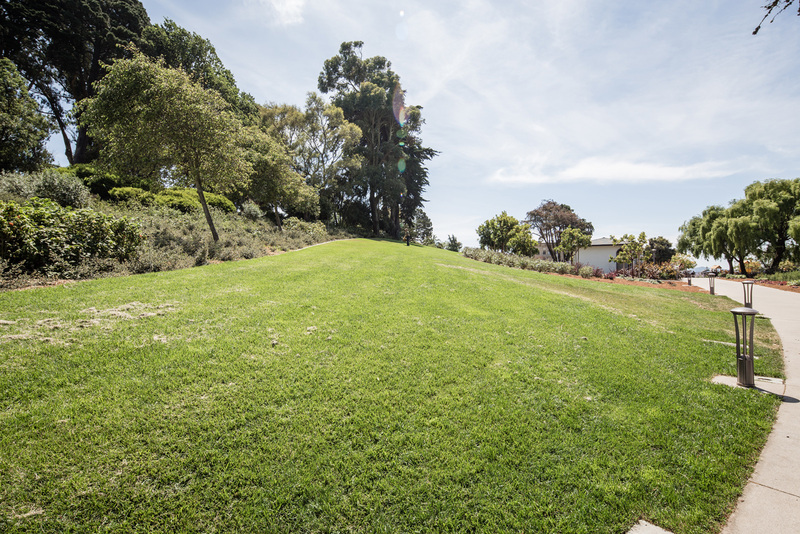 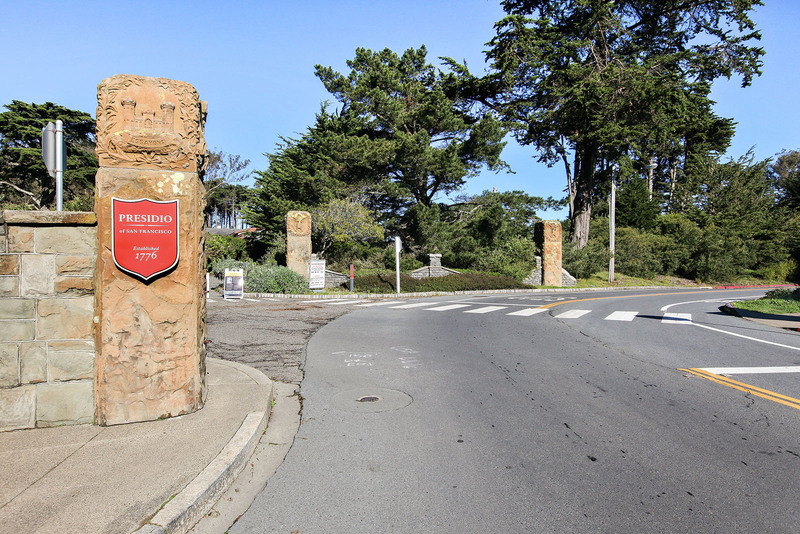 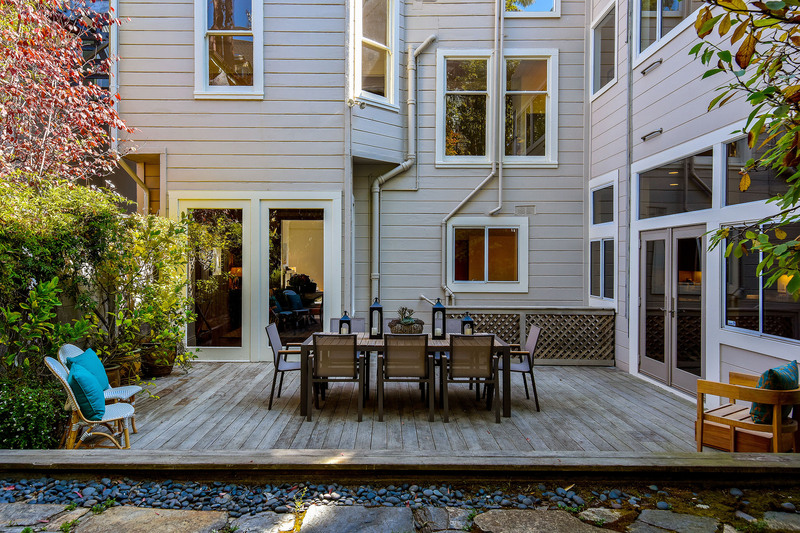 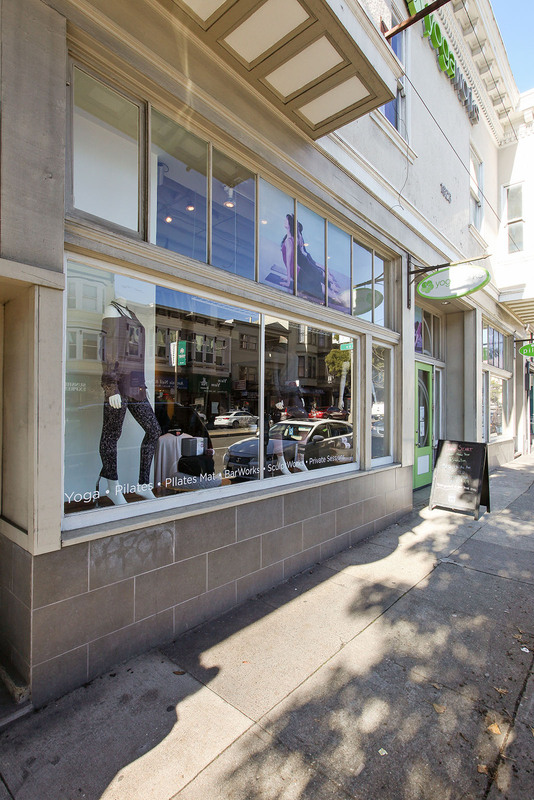 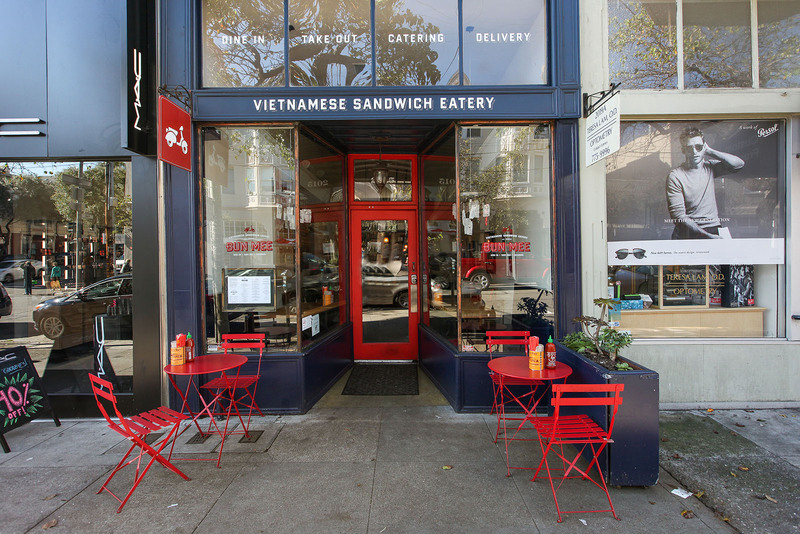 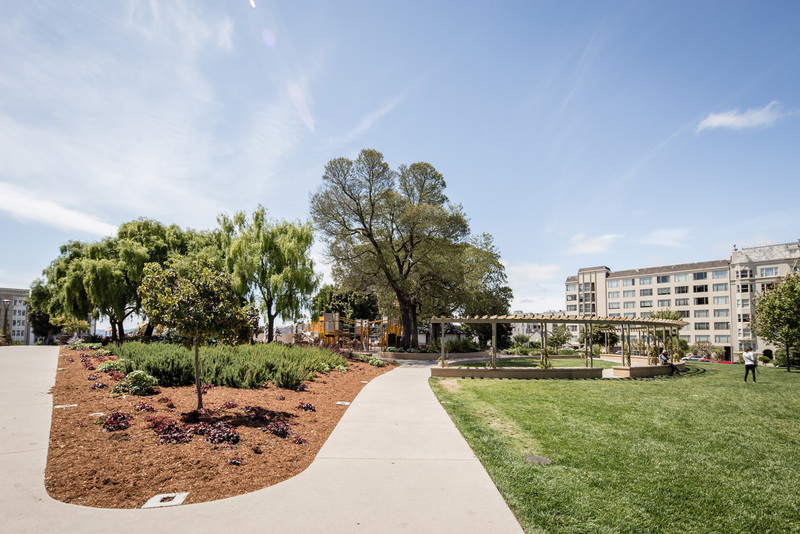 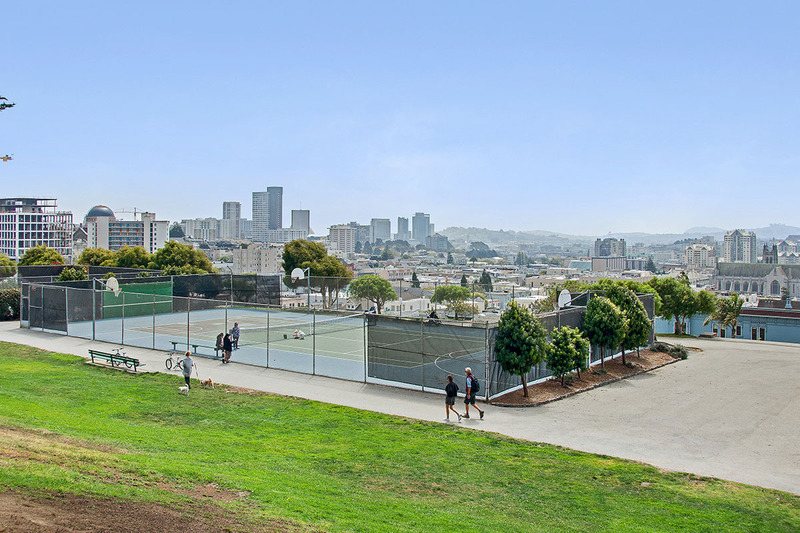 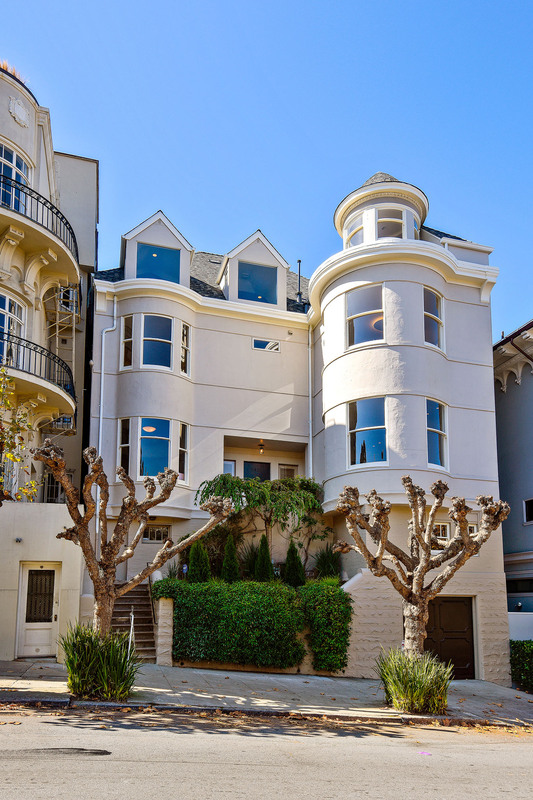 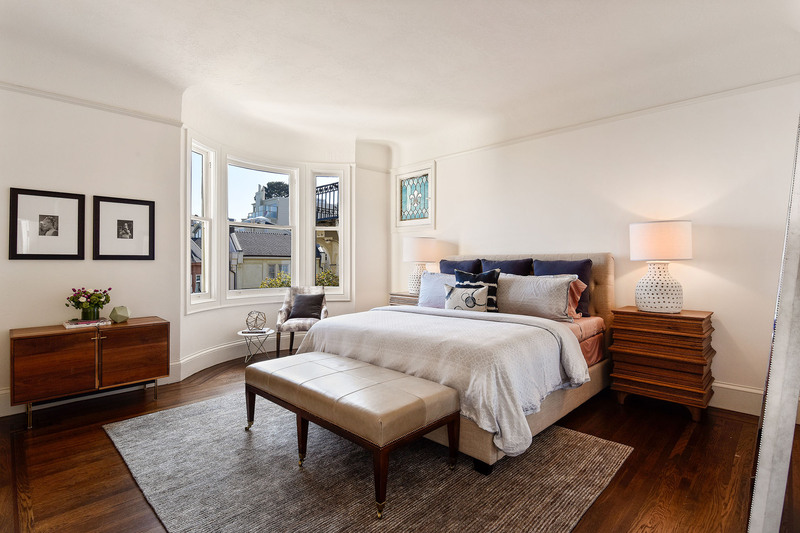 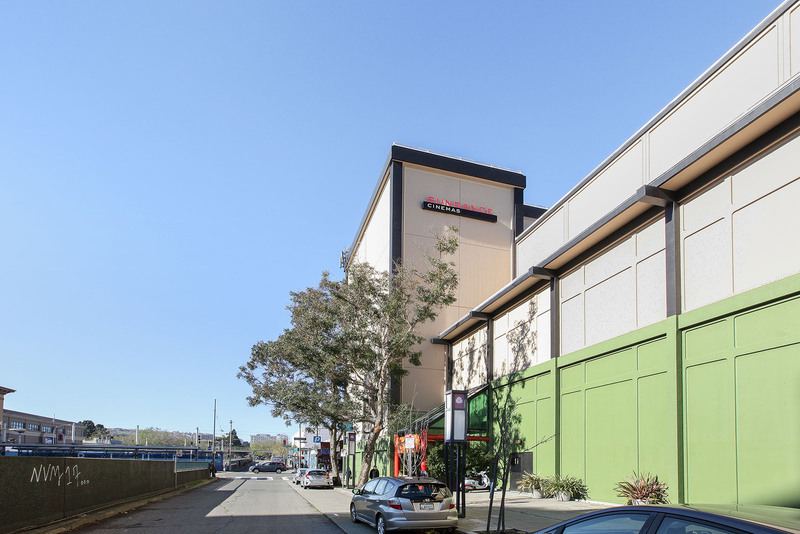 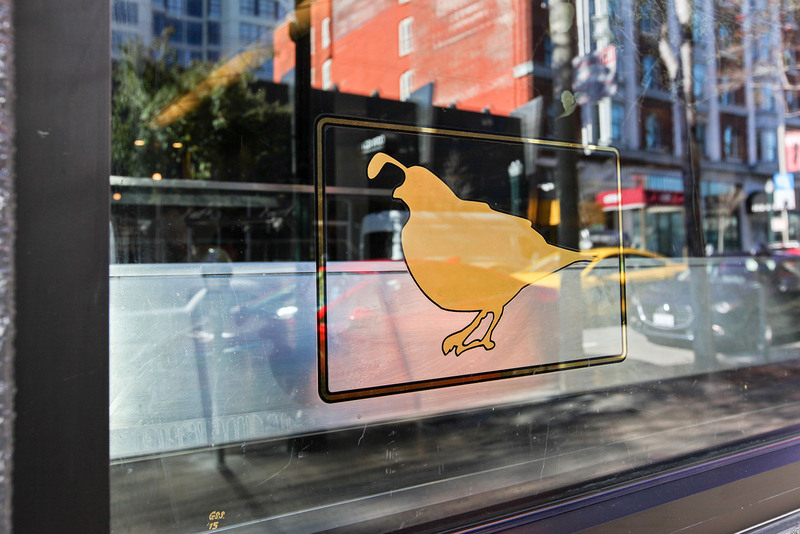 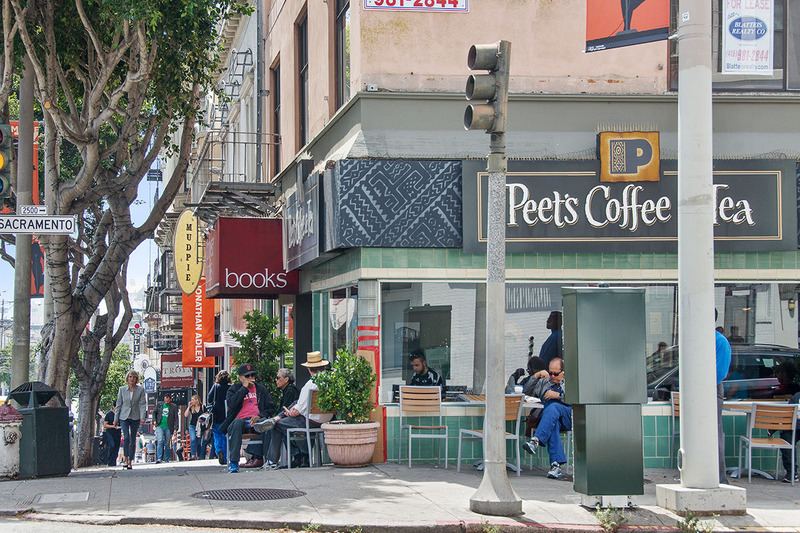 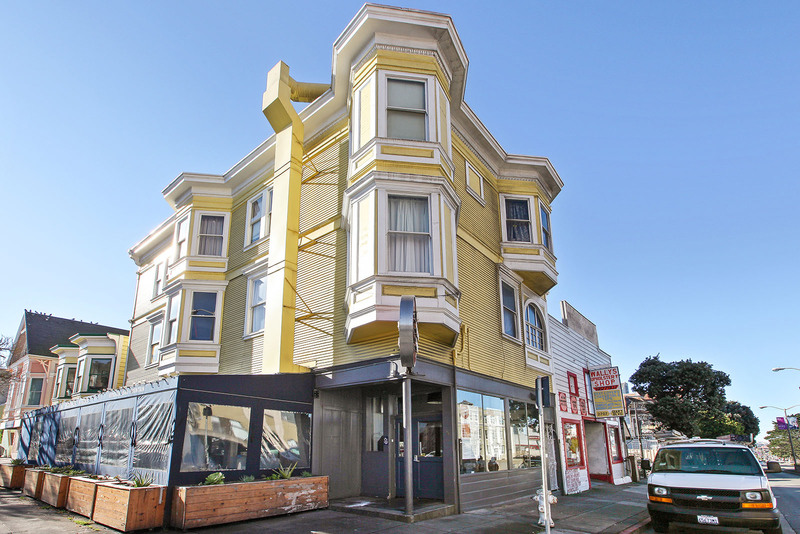 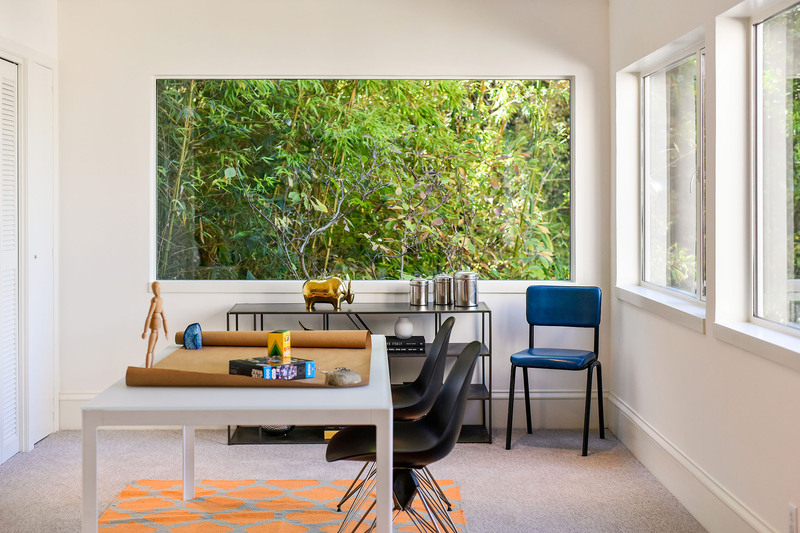 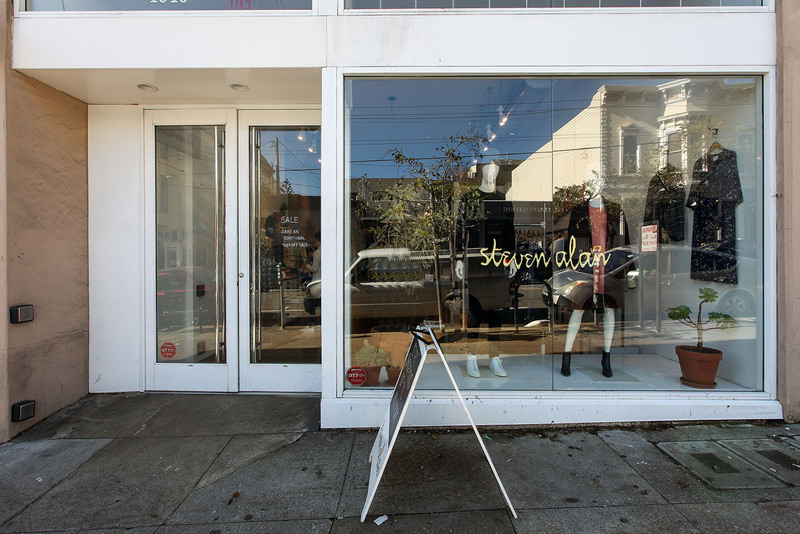 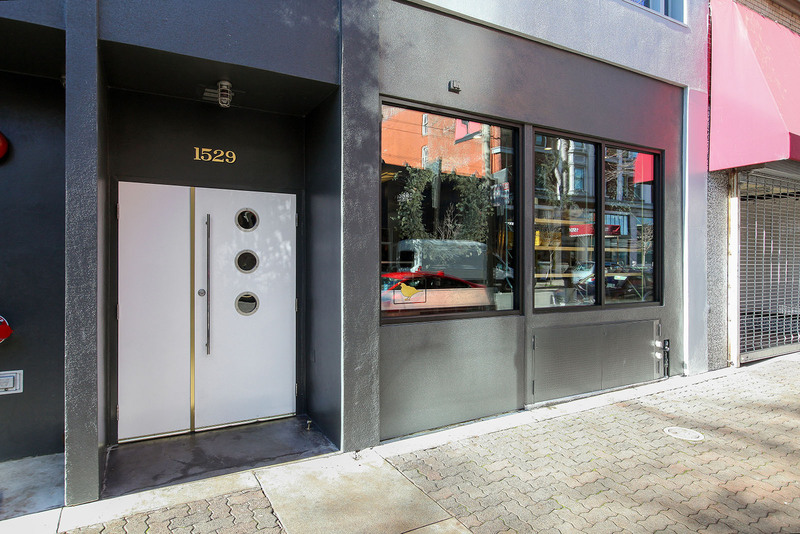 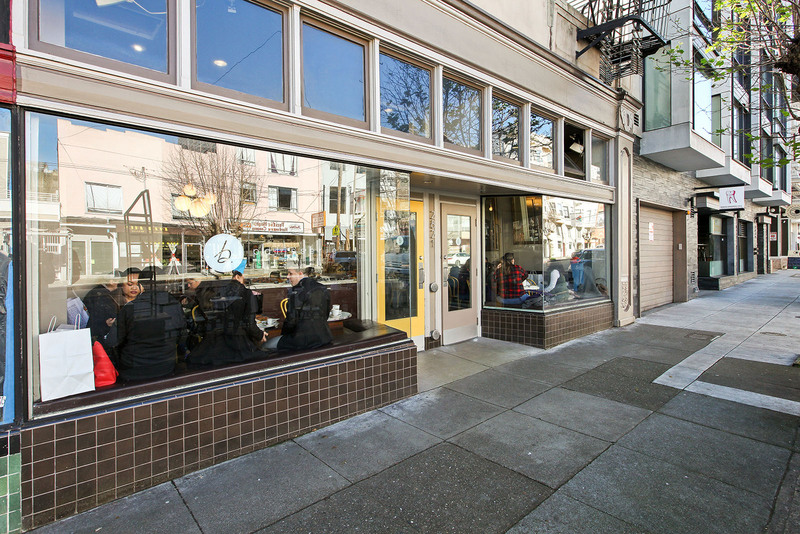 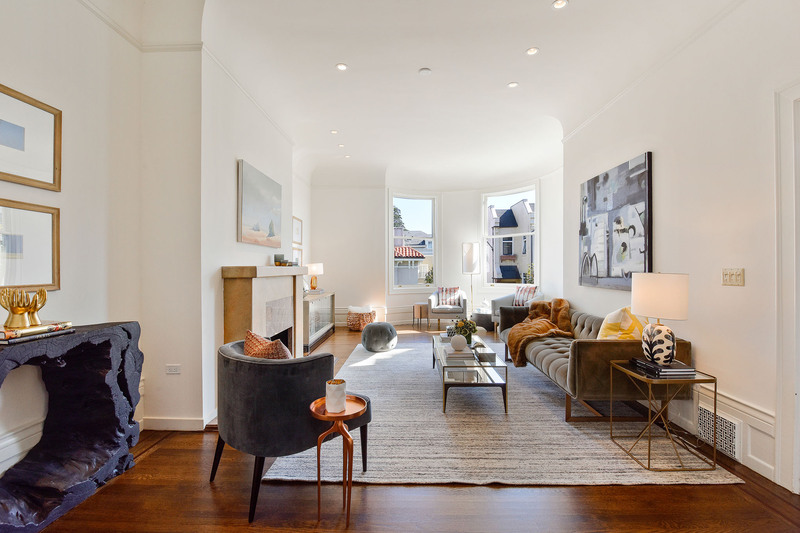 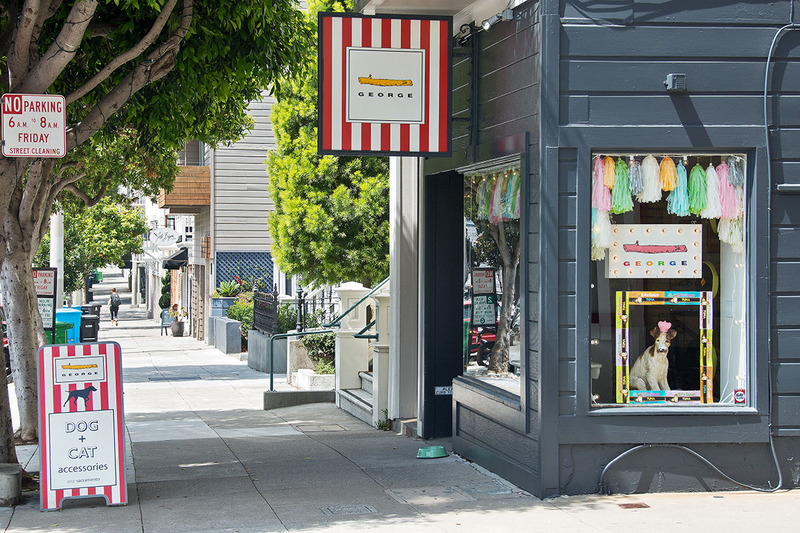 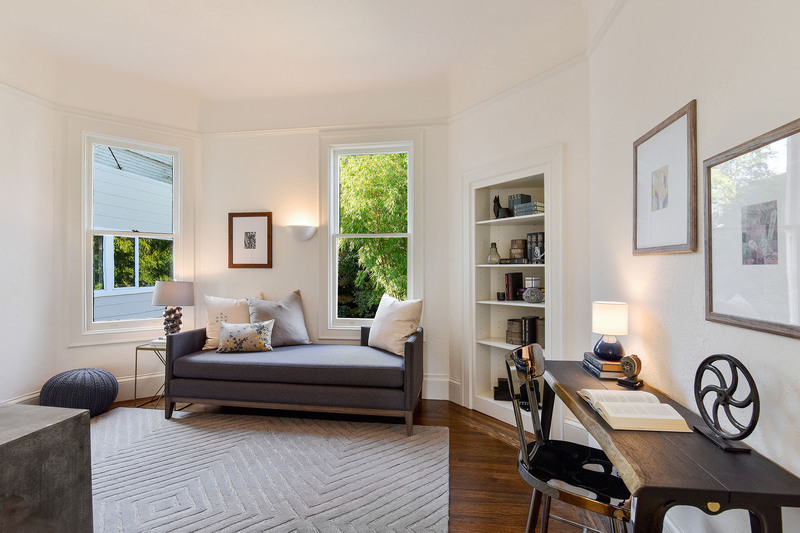 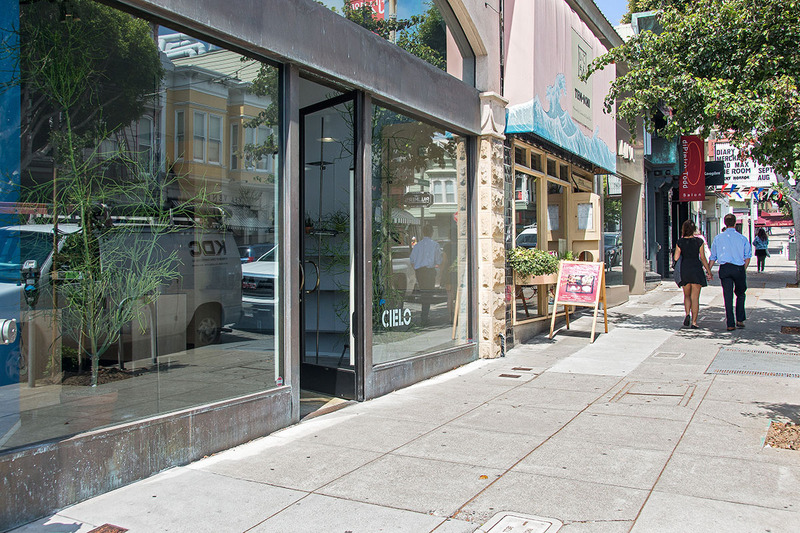 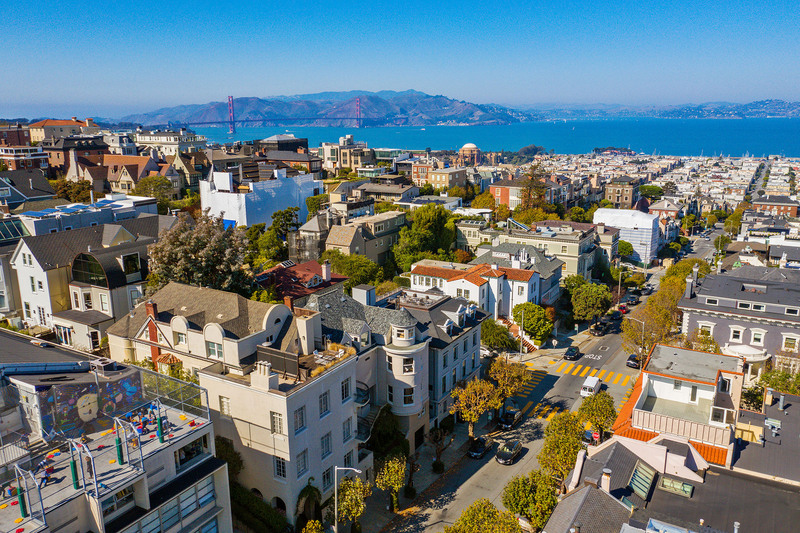 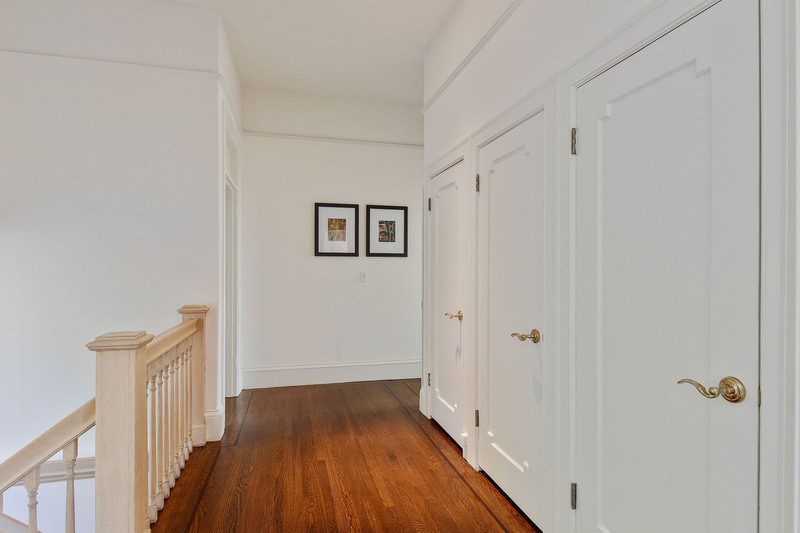 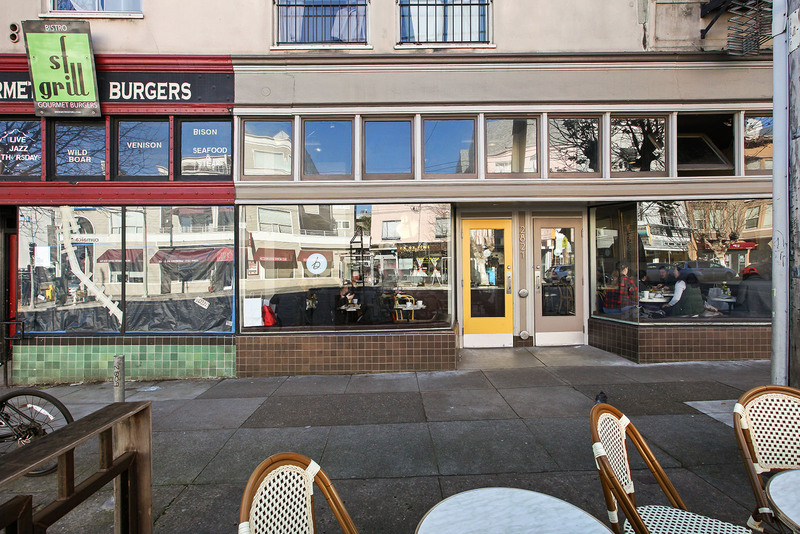 Its unmatched location offers a short walk to Fillmore Street, Union Street, Alta Plaza Park, and Crissy Field, and is blocks from many of SF’s best private schools. 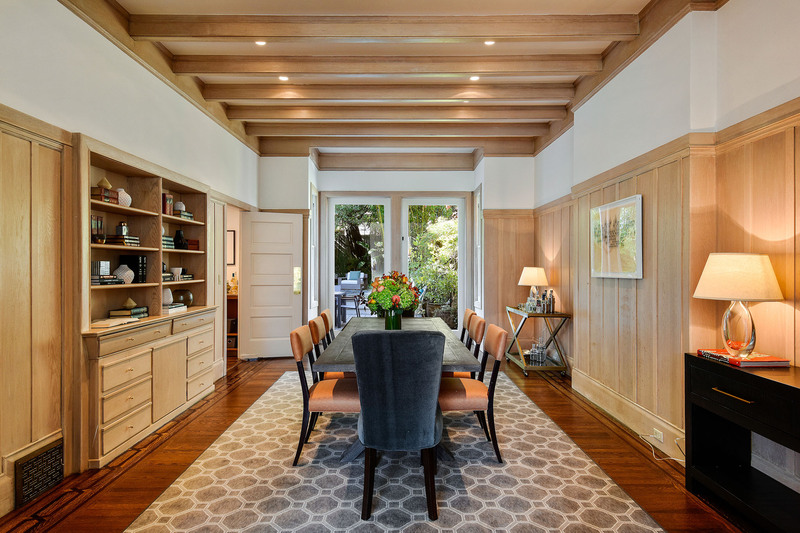 Its personality flourishes today with voluminous rooms layered in refined design elements—rich hardwood floors, ash-stained wood, box-beamed ceilings, and striking curved bays. 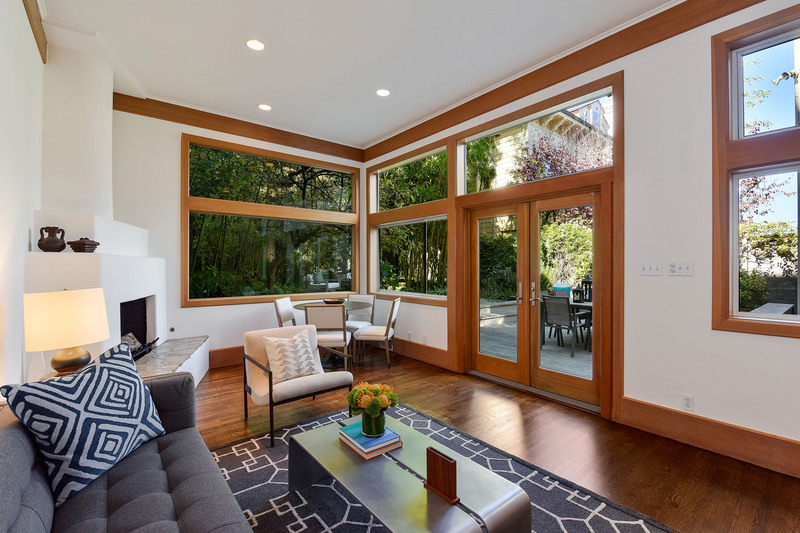 The extra wide 40-foot lot can be felt throughout the house. 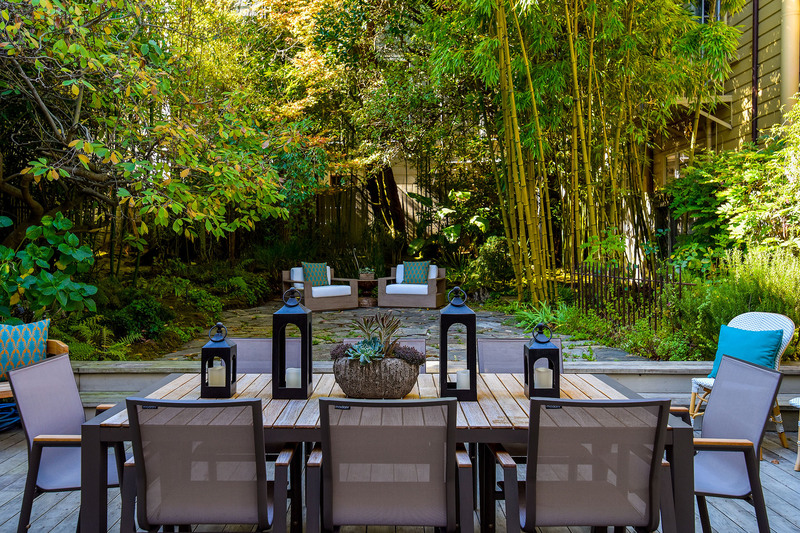 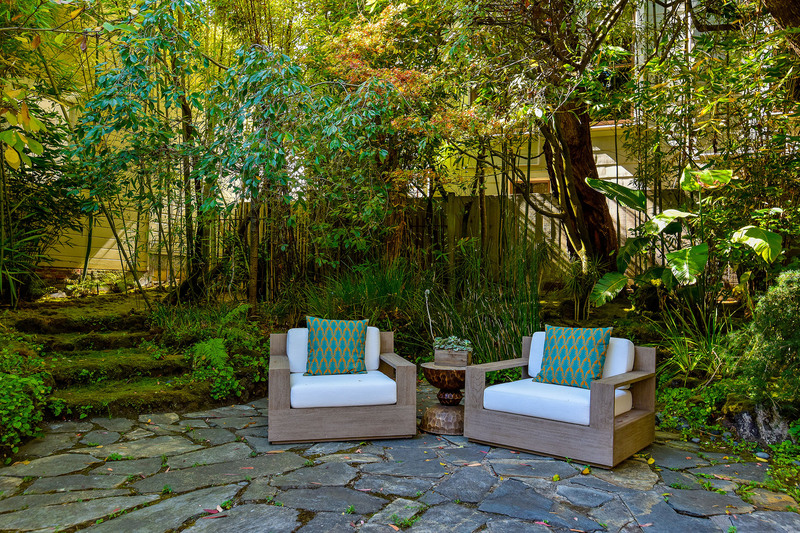 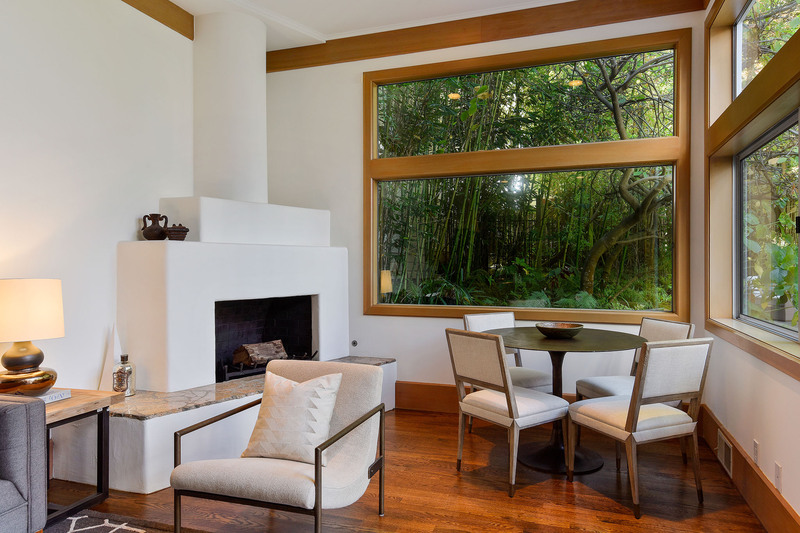 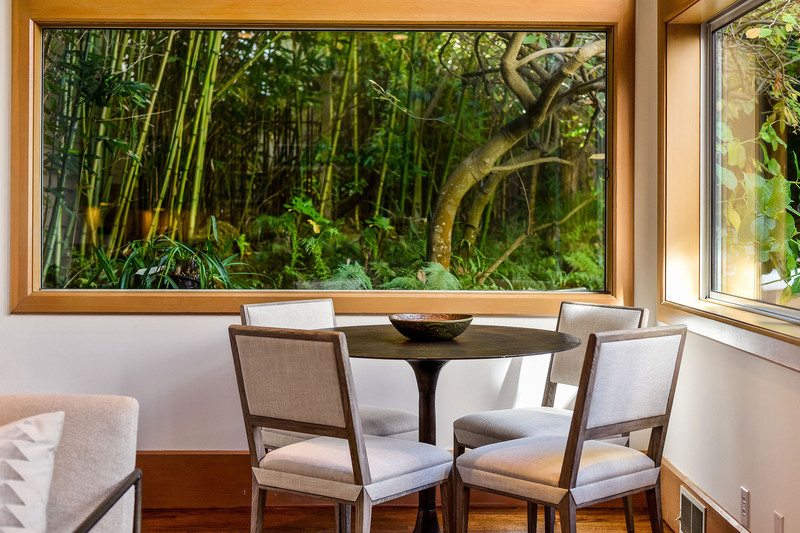 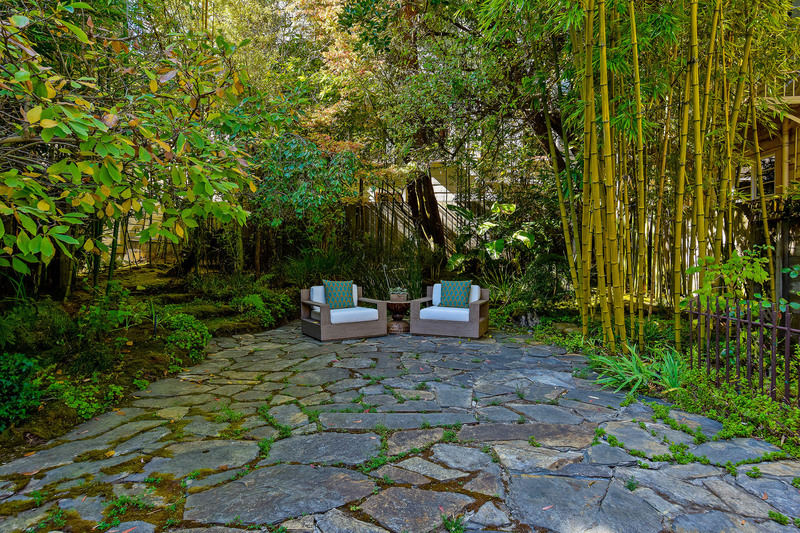 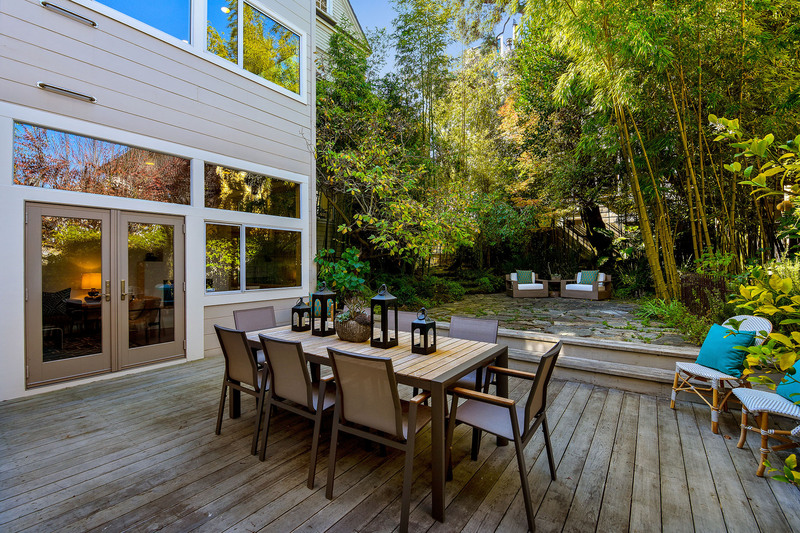 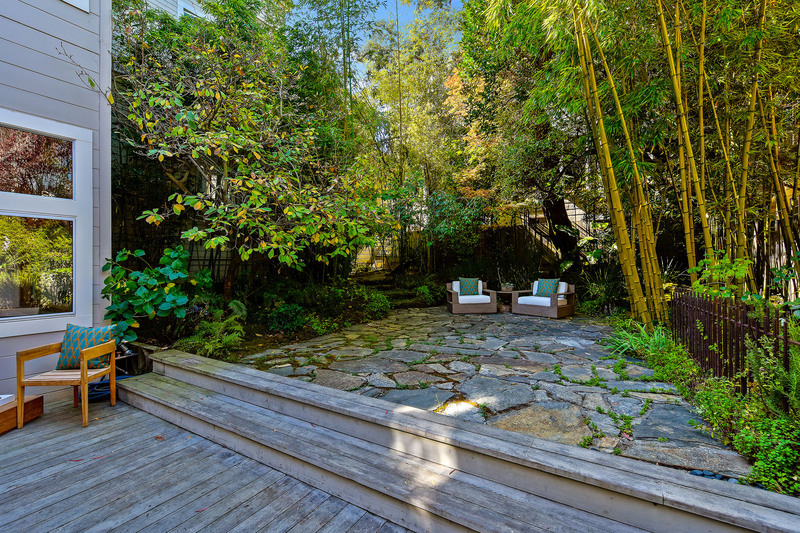 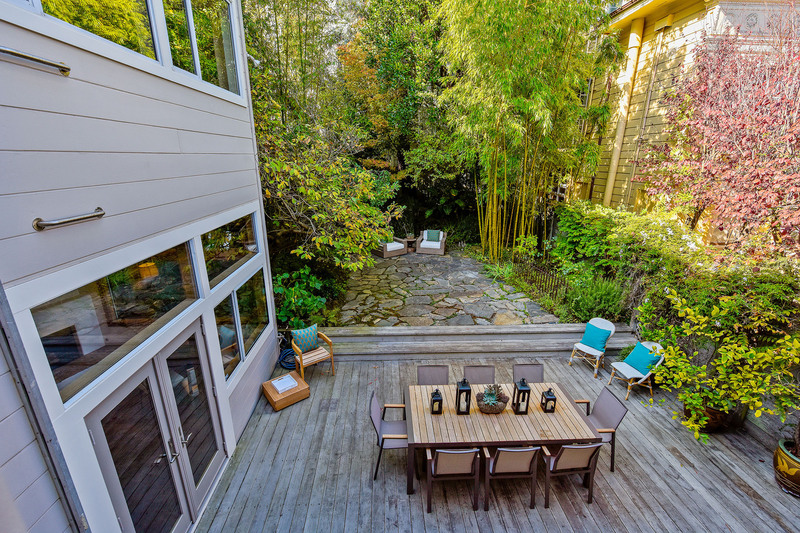 The floorplan circulates around the serene backyard with a bamboo garden swaying over the large private deck and flagstone patio, creating seamless indoor-outdoor flow from the kitchen, family, and living rooms. 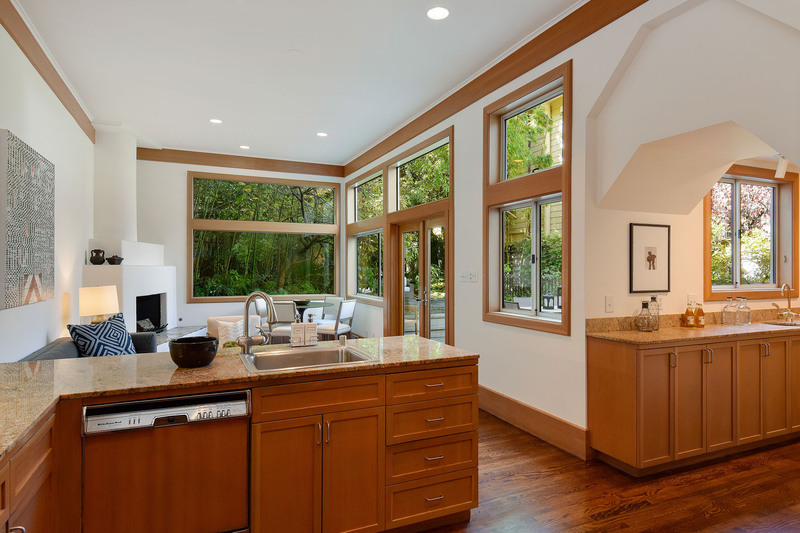 Windows burst with wonderful Bay views and incredible light shines in the house all day. 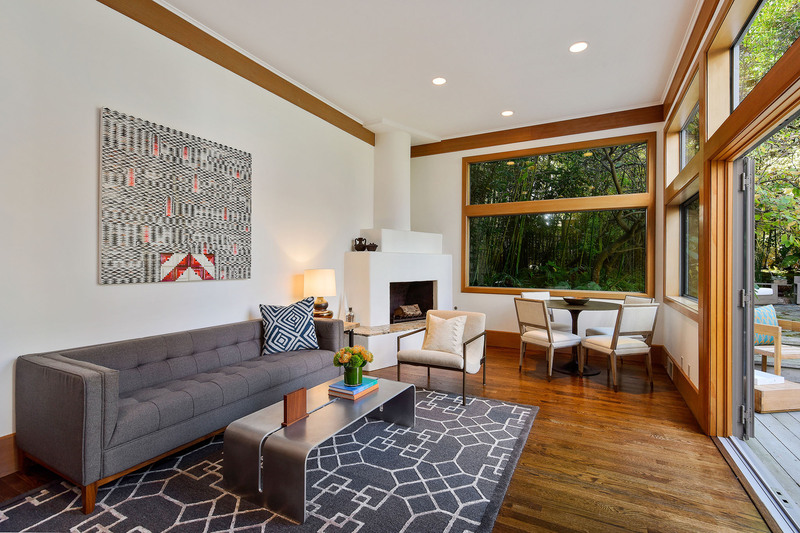 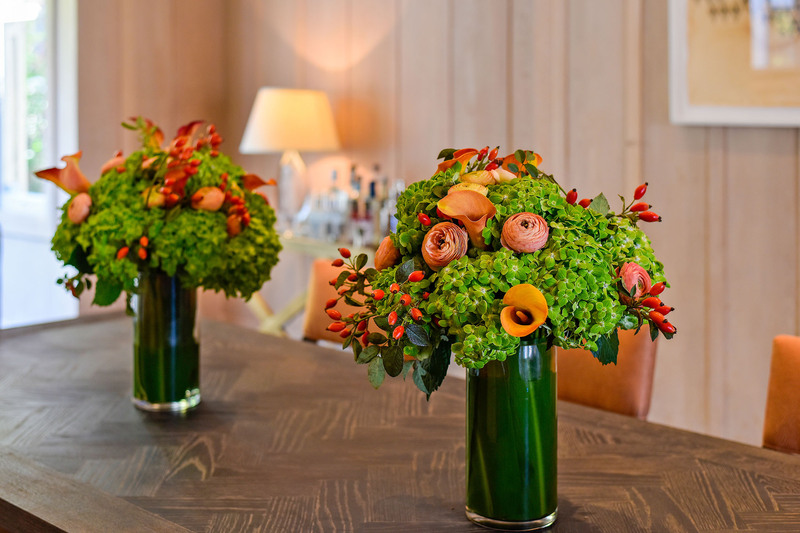 With form and function, the superb floorplan is ideal for intimate family living or lively events, fundraisers, and seasonal gatherings alike. 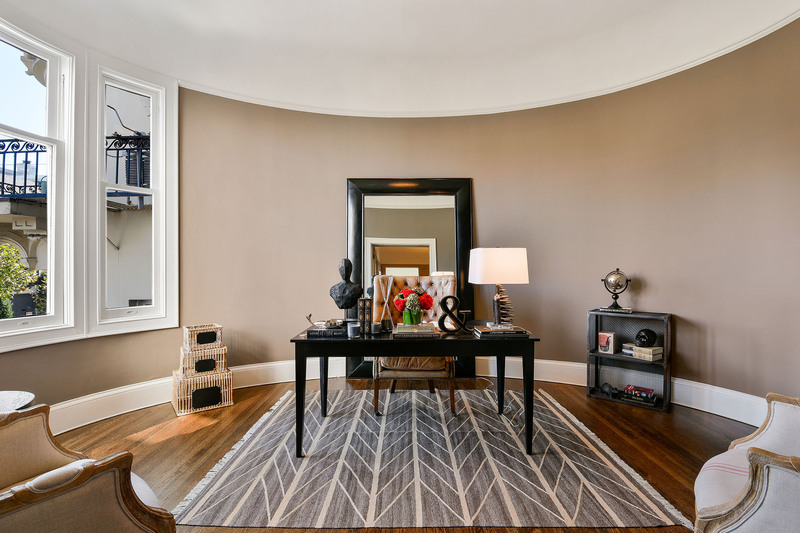 Main Level- The first floor “oval office” provokes awe. 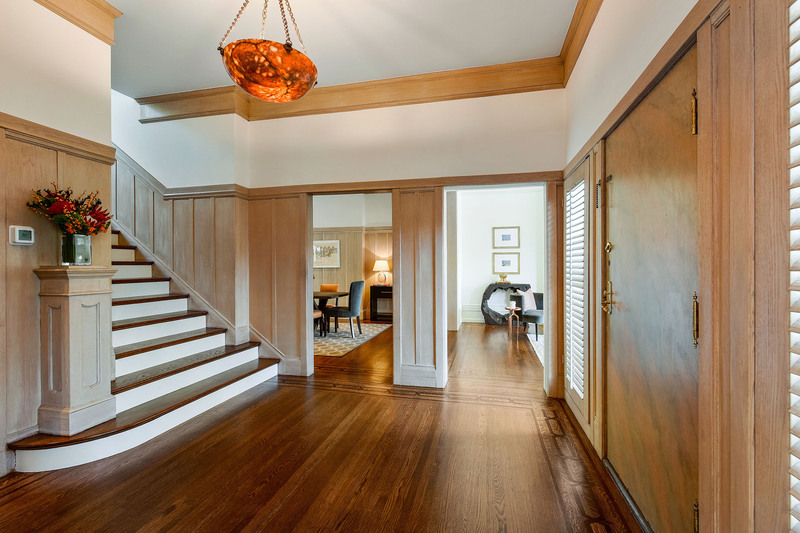 Lofty 12-foot-plus ceilings flow through the grand foyer, living room with fireplace, and formal dining room with wainscoting, built-in cabinetry, and oversized glass doors to the deck. 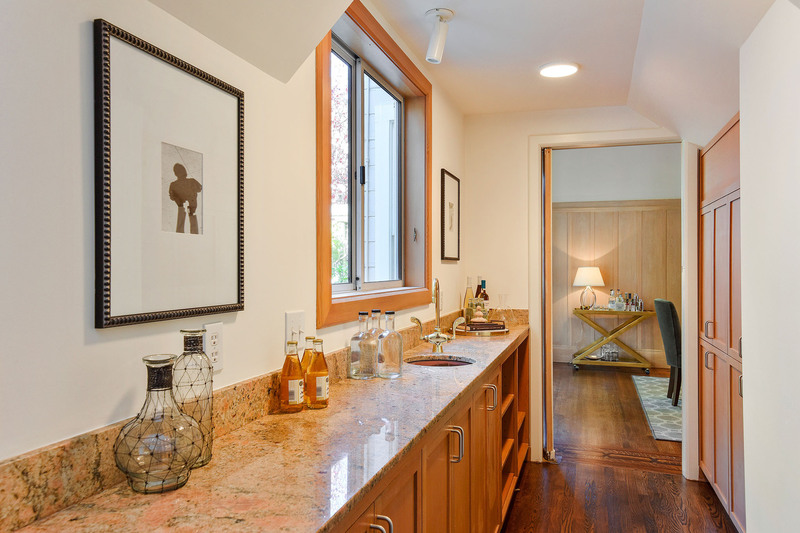 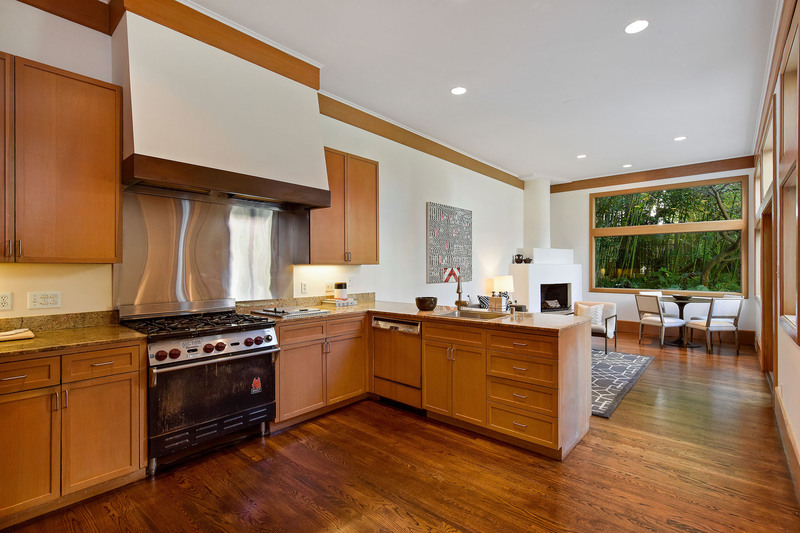 A butler’s pantry leads to the chef’s kitchen and family room, an open concept with a large-scale, adobe-style corner fireplace and broad picture windows framing the gardens. 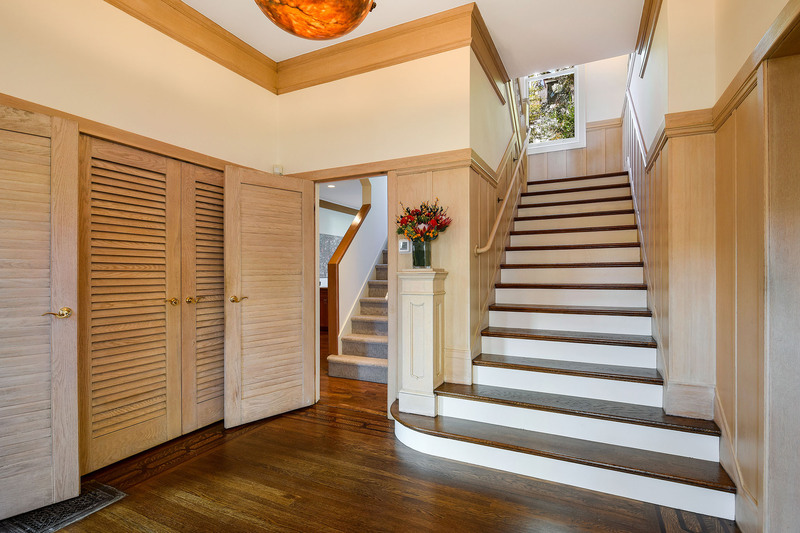 Second Level – The wide wood stairway overlooking the greenery outside leads upstairs to 10+ foot ceilings in four extra-large bedrooms. 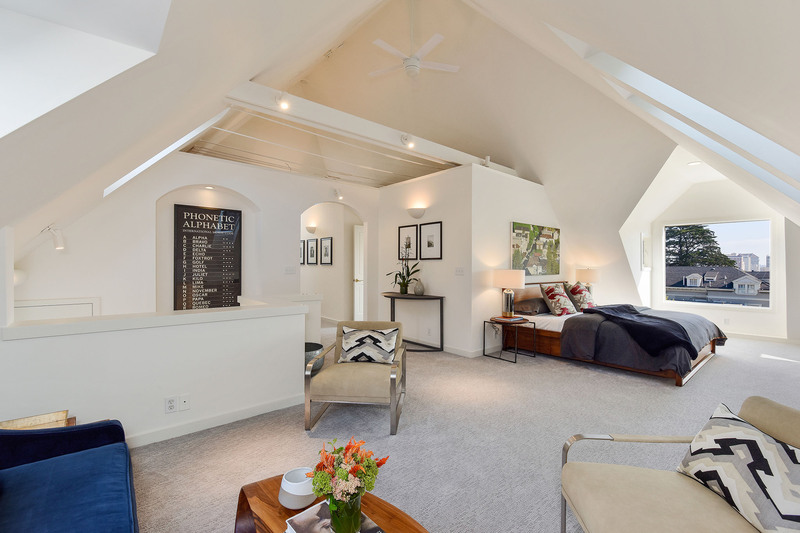 Each unique in design, bedrooms feature elements of hardwood floors with perimeter inlays, walk-in closets, three full baths, a colorful stained-glass window, a marble fireplace, curved bays with curved windows, and a freshly carpeted master suite. 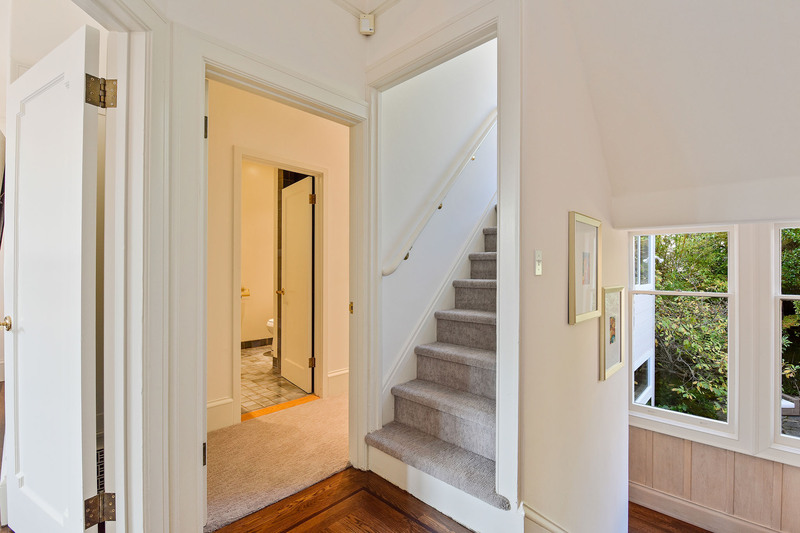 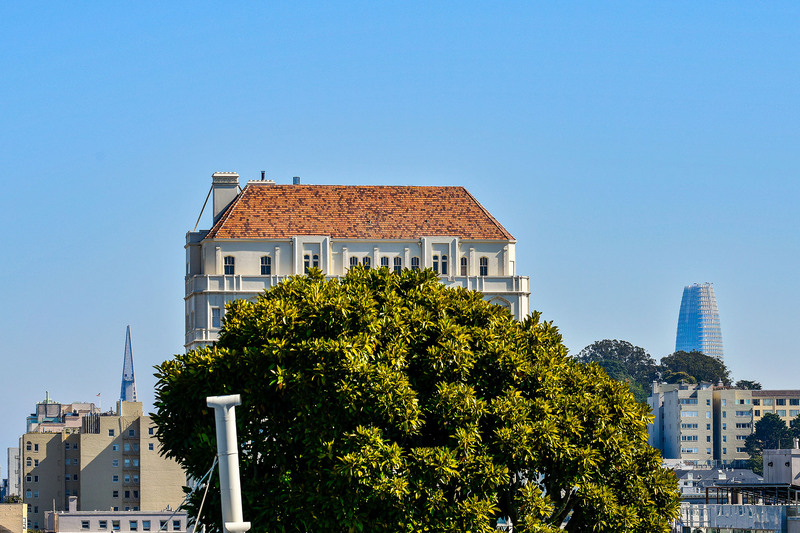 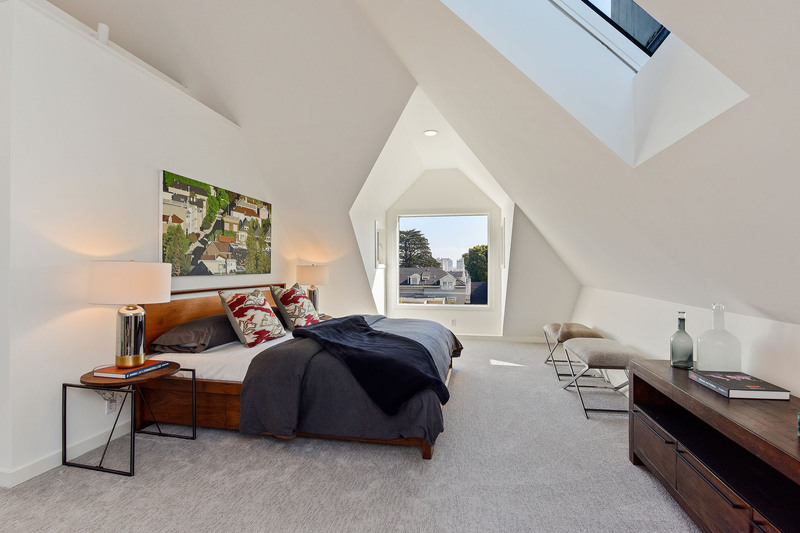 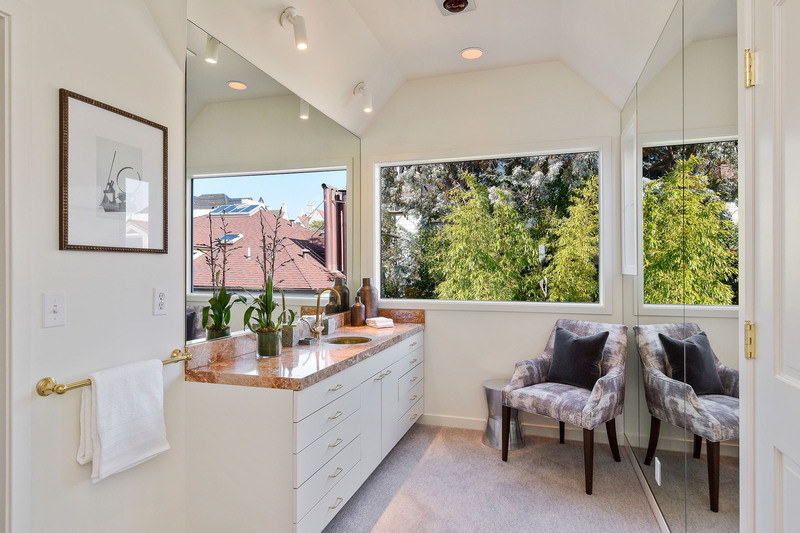 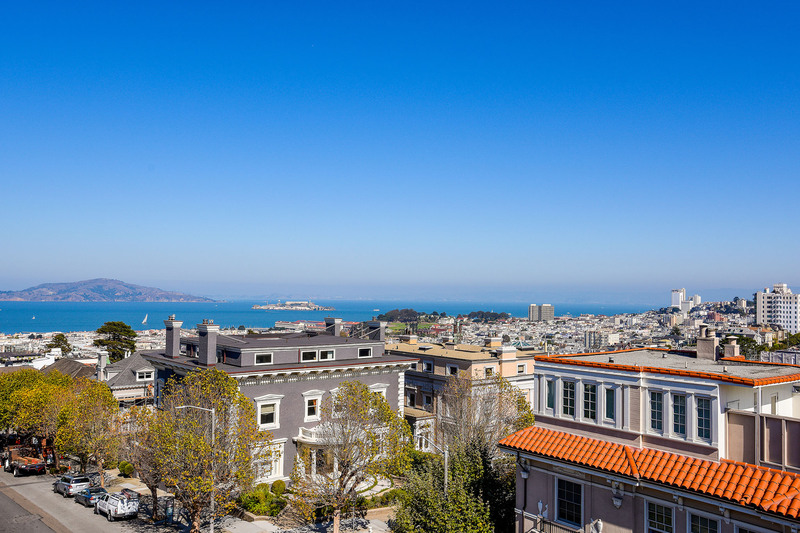 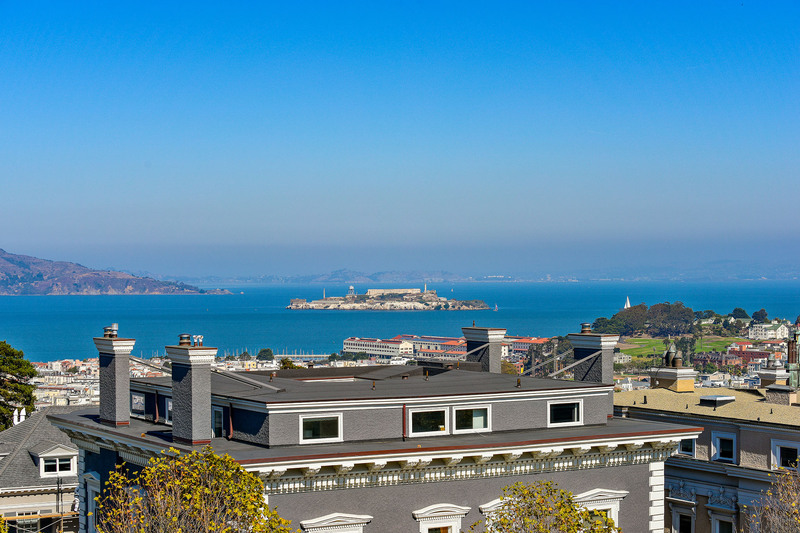 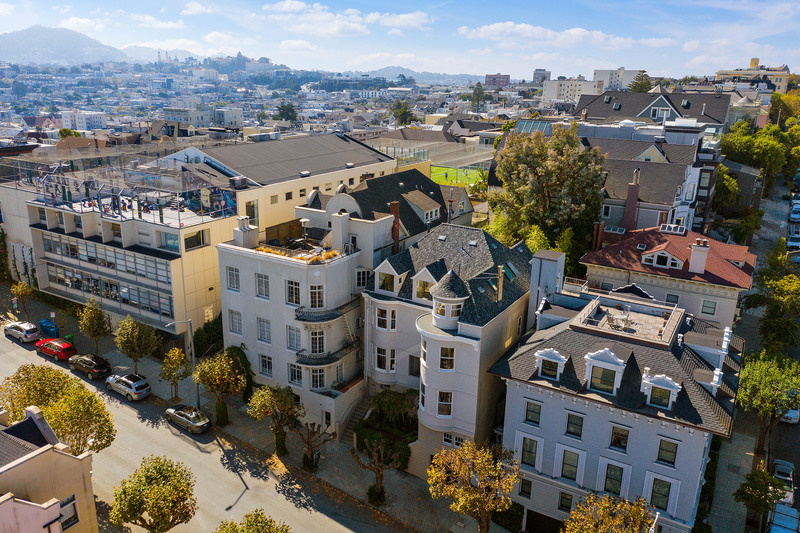 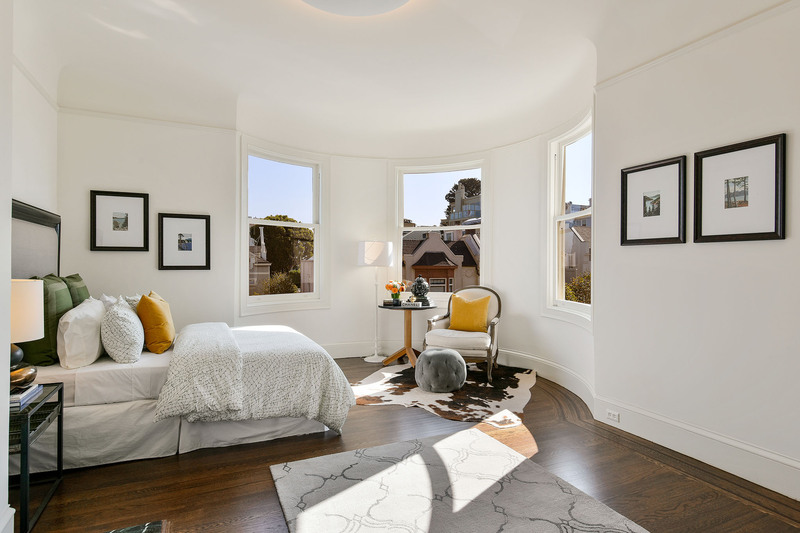 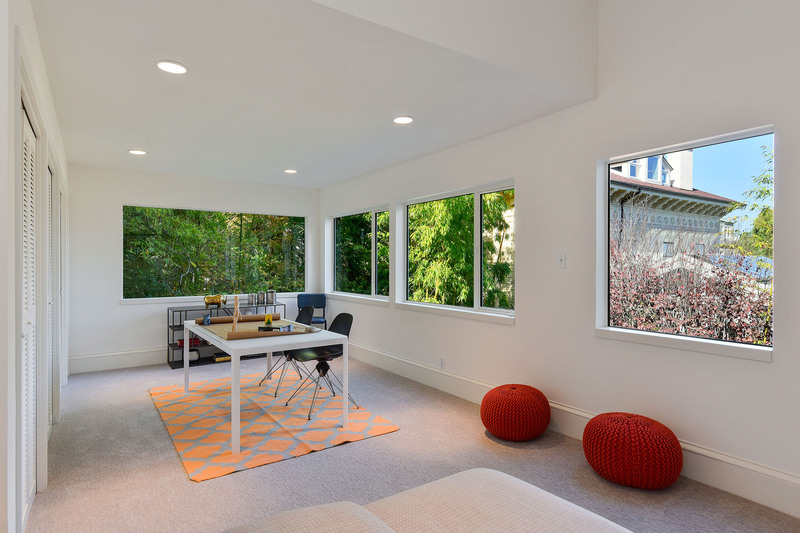 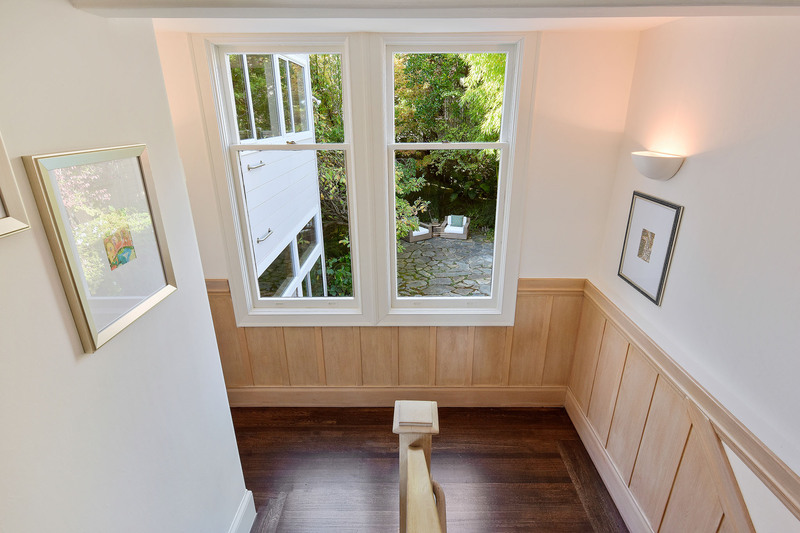 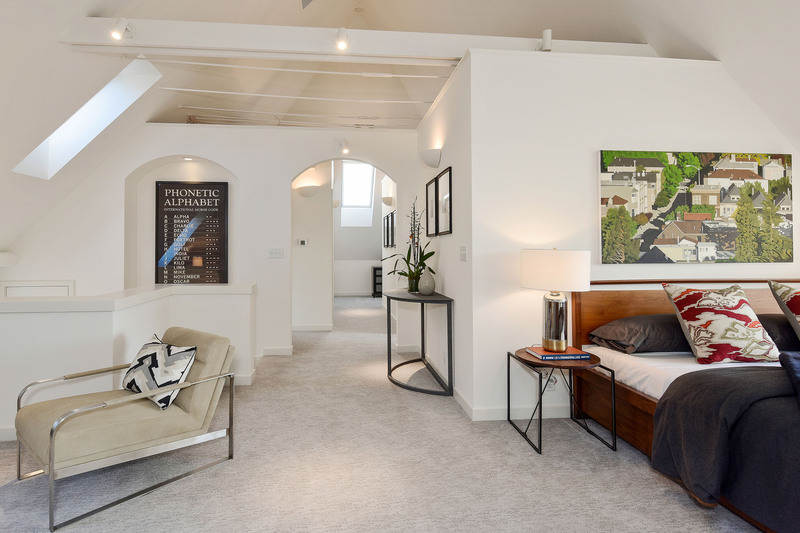 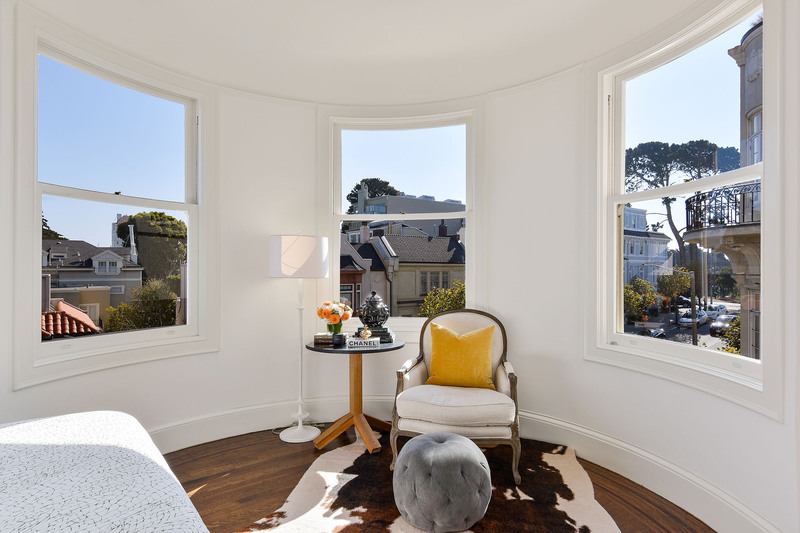 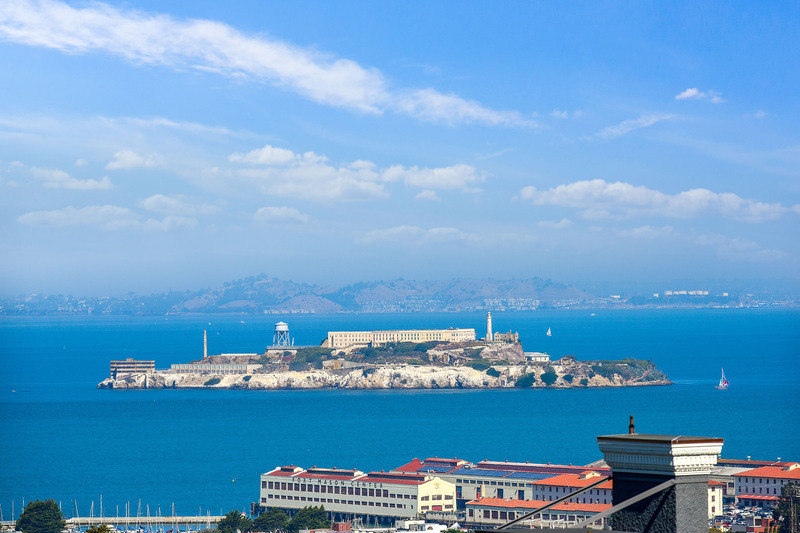 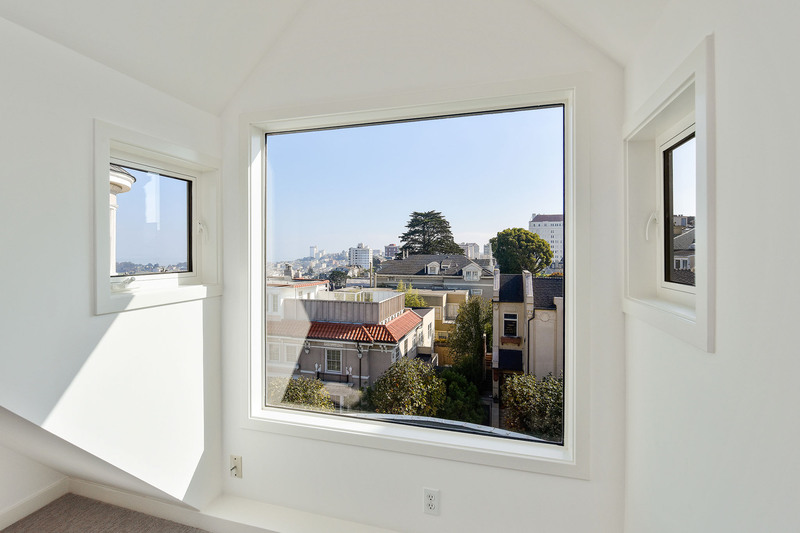 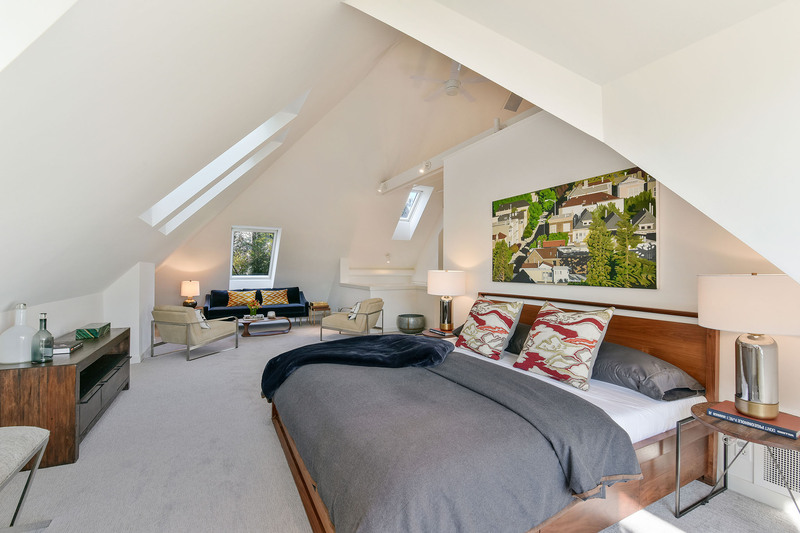 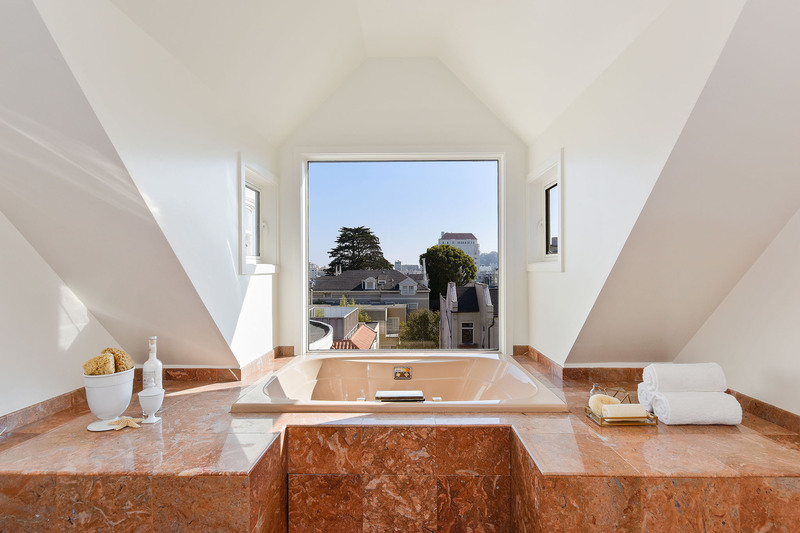 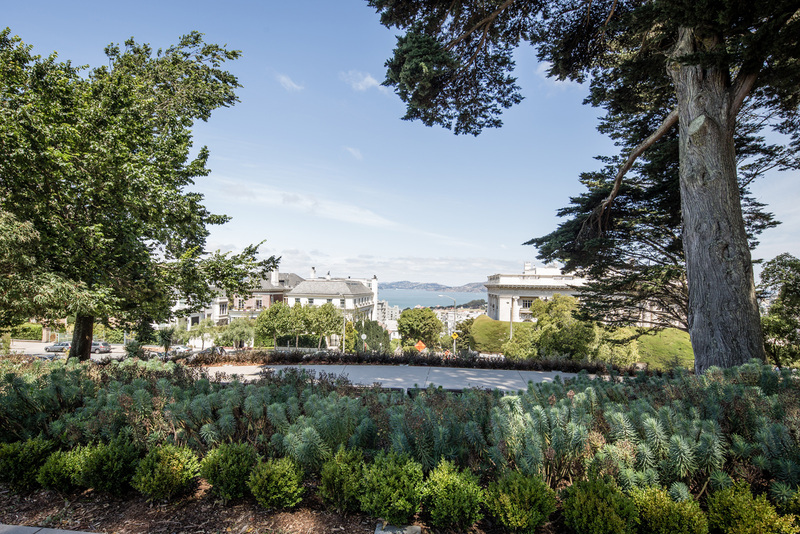 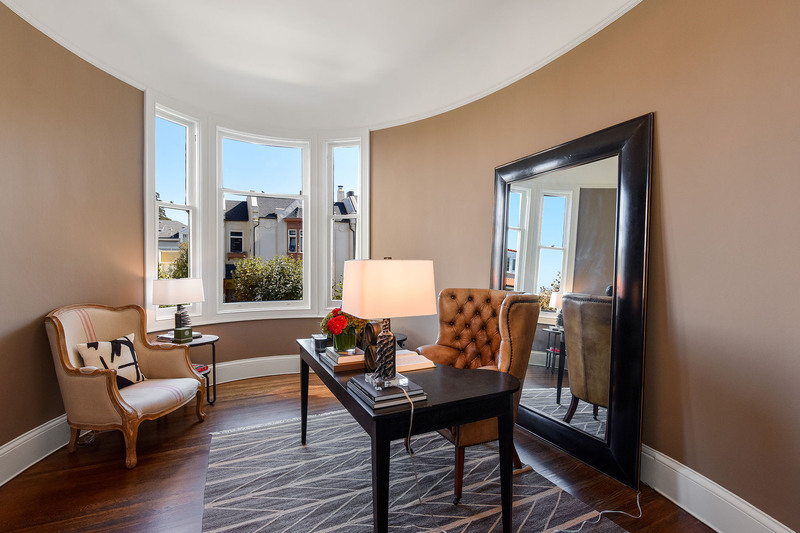 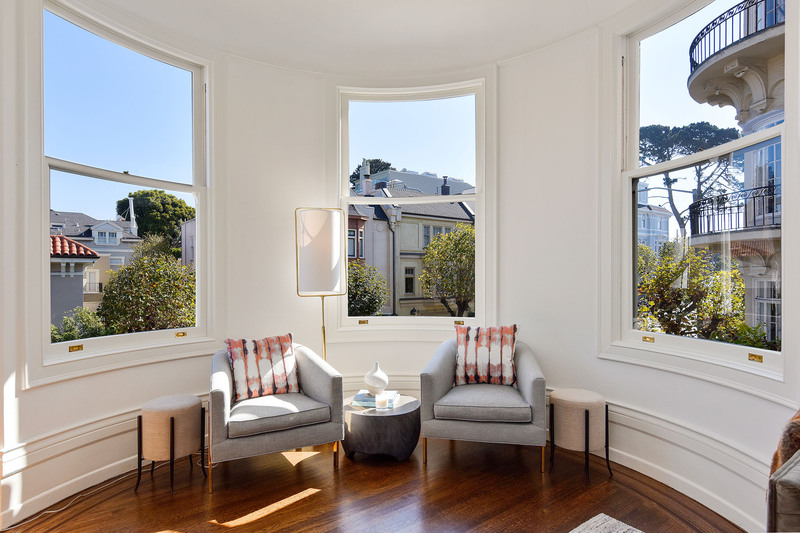 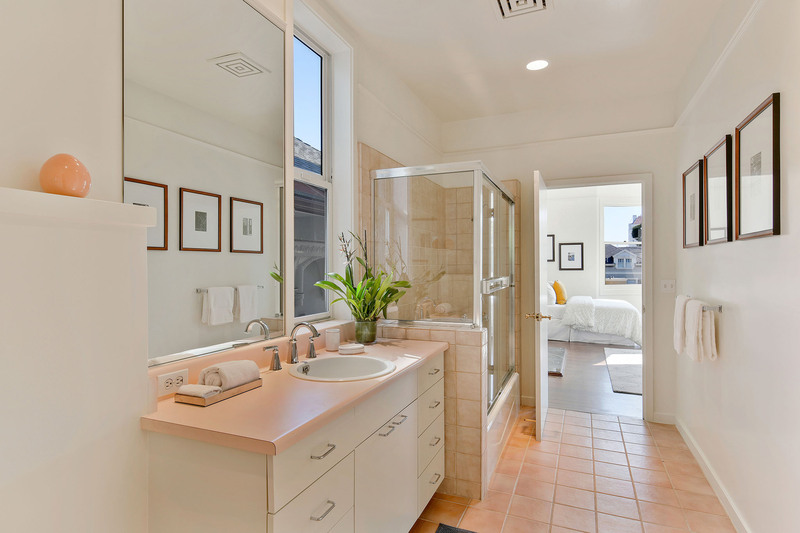 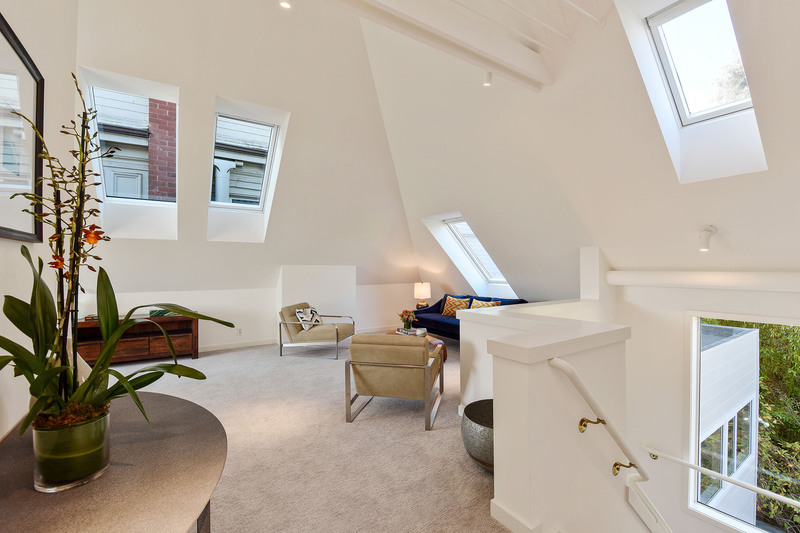 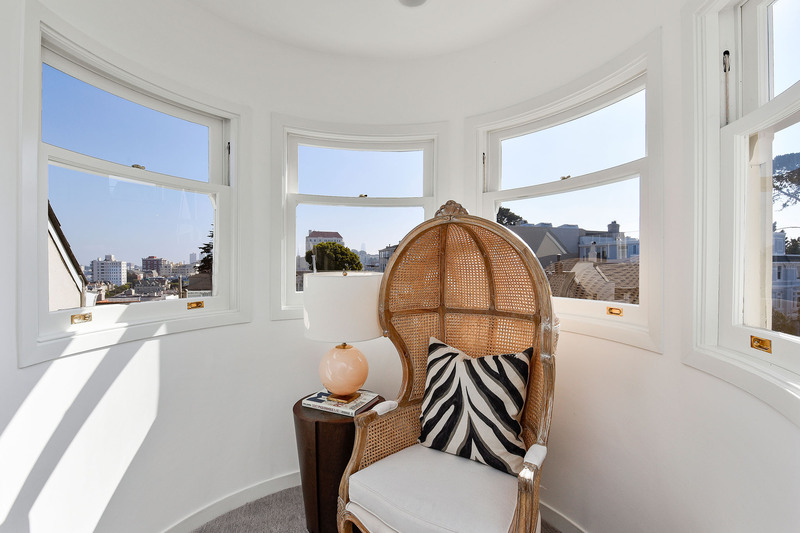 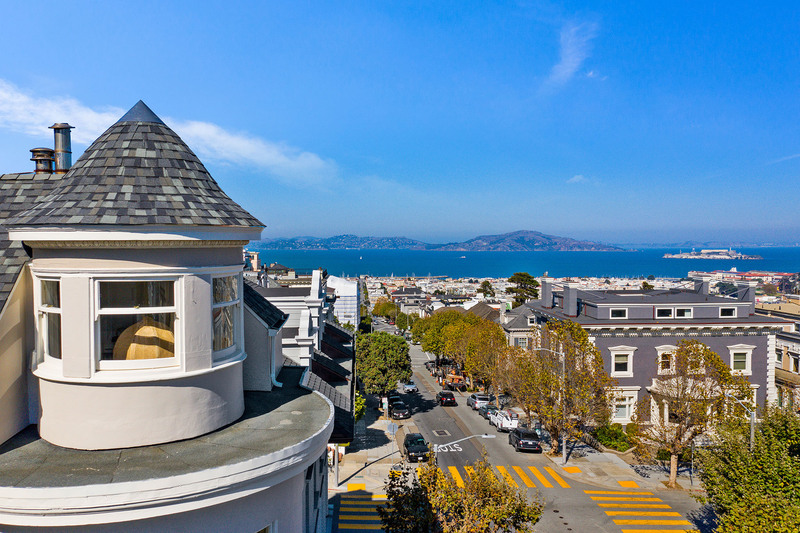 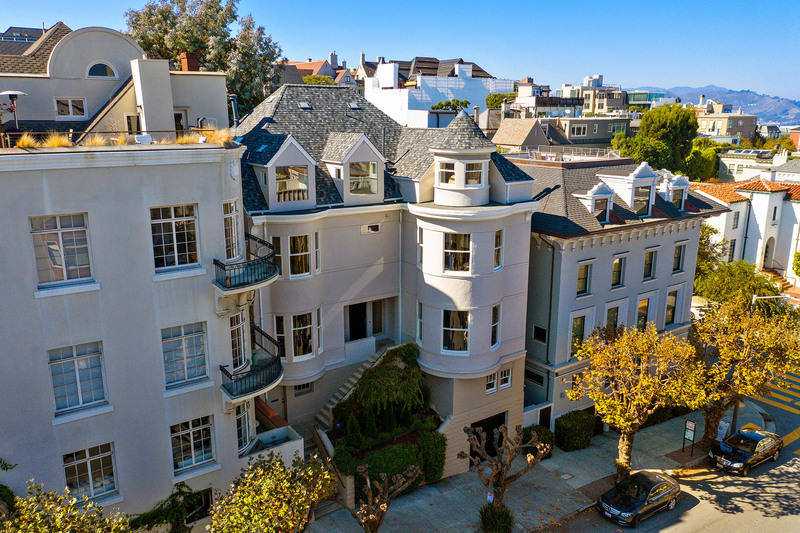 Third Level - Dramatic views abound from the master and 6thbedroom/office—Pacific Heights homes, Alcatraz Island, and sailboats on the Bay through picture windows and from the castle-like turret. 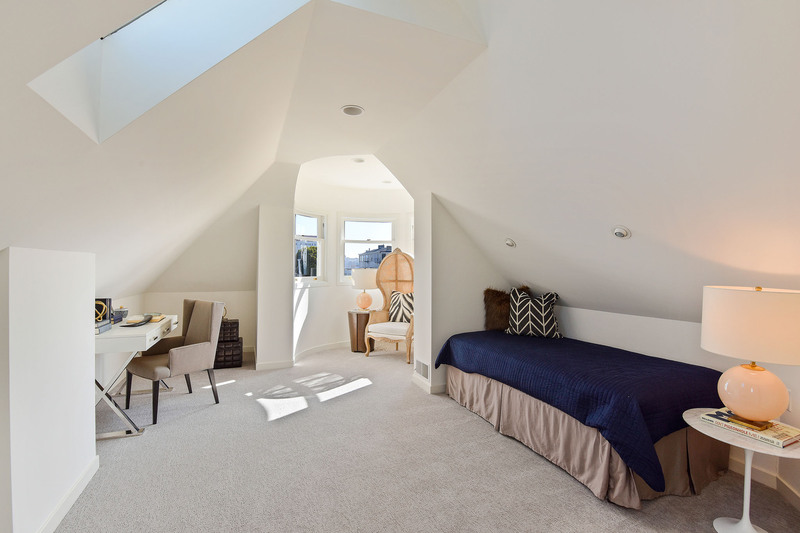 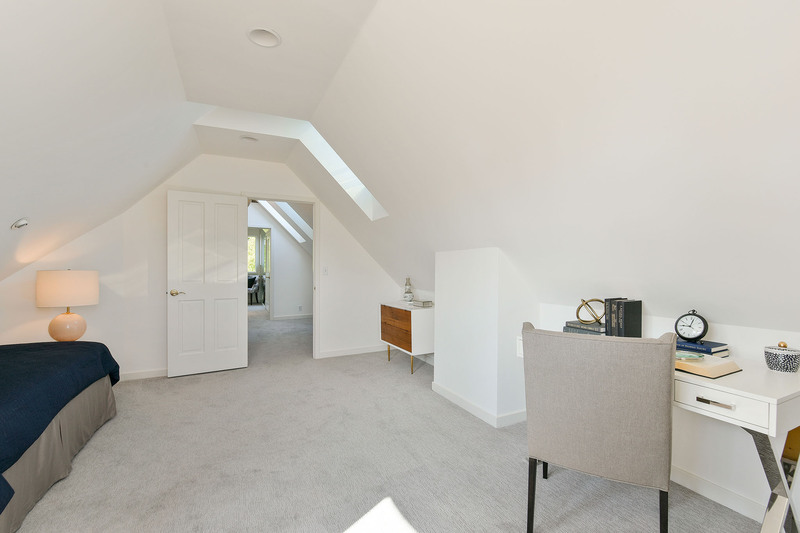 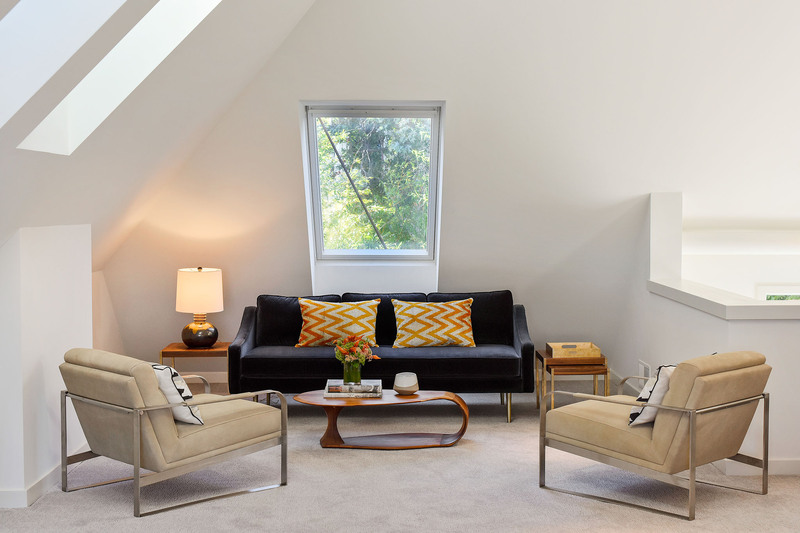 With vaulted ceilings and multiple skylights, the huge upstairs master includes a dressing room and large closet, water closet, and soaking tub under a view window. 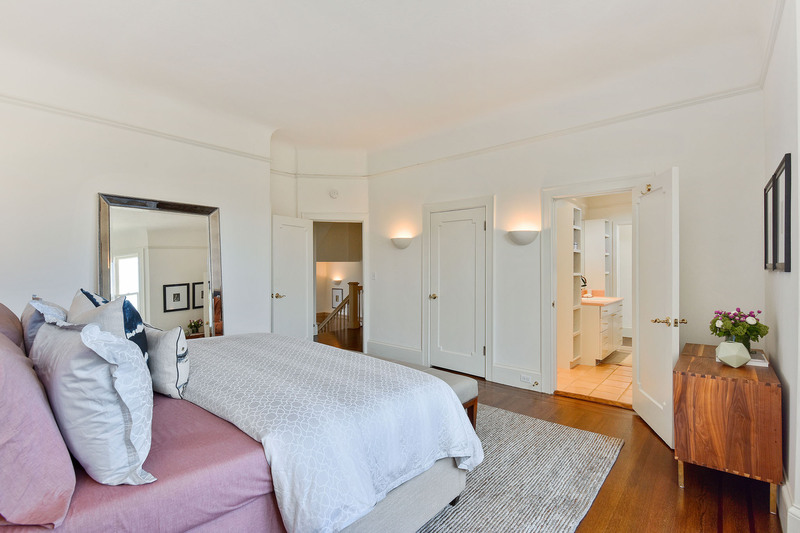 The 6thbedroom is served by an adjacent dressing room and half bath. 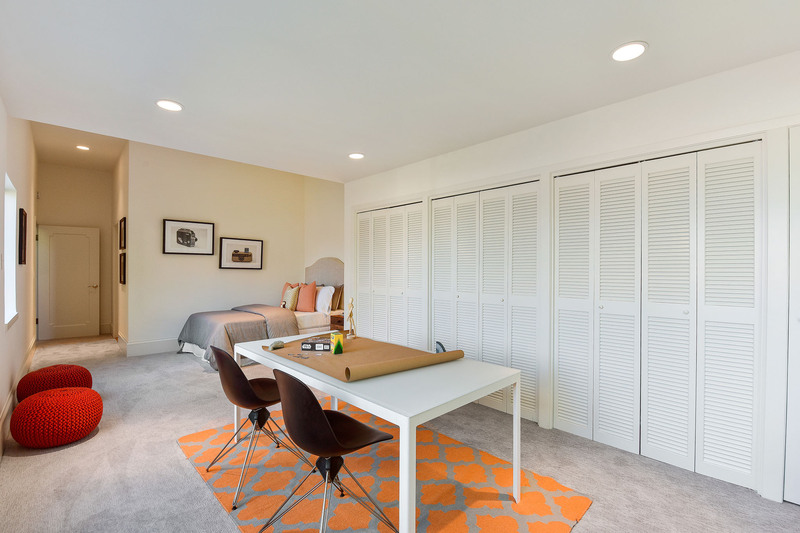 Lowest level has eight-plus storage closets, a full-sized laundry room, a water closet, and access to the two-car tandem garage. 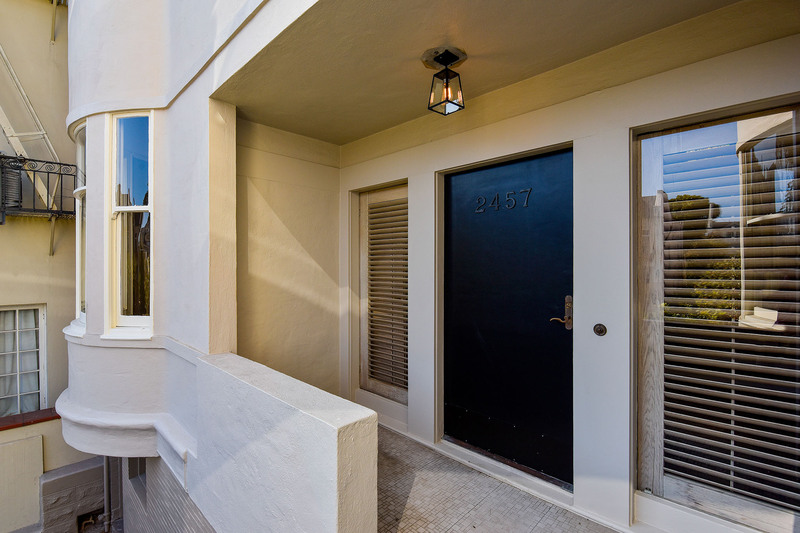 2457 Scott marries exquisite living with dynamic lifestyle. 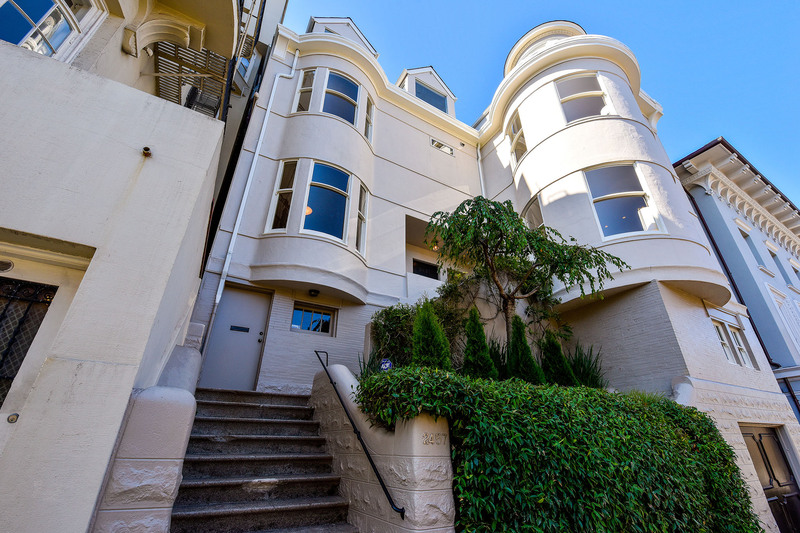 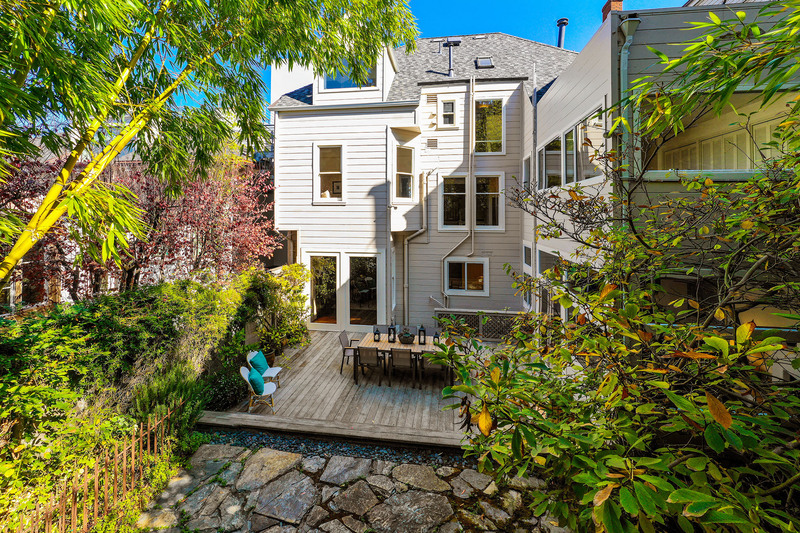 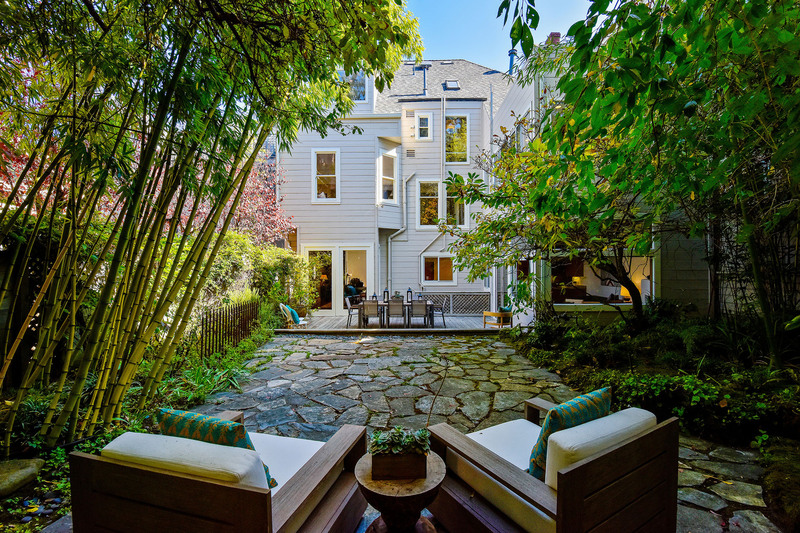 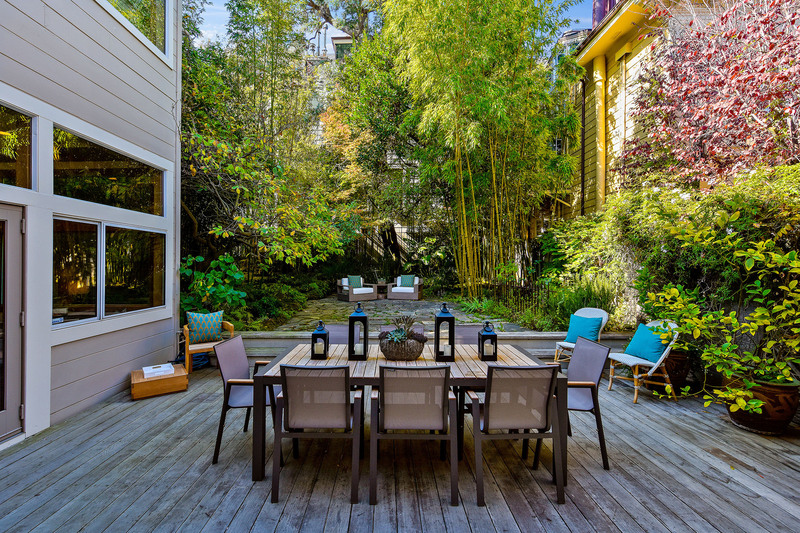 A San Francisco home of this magnitude in such an exceptional location is a very rare opportunity.